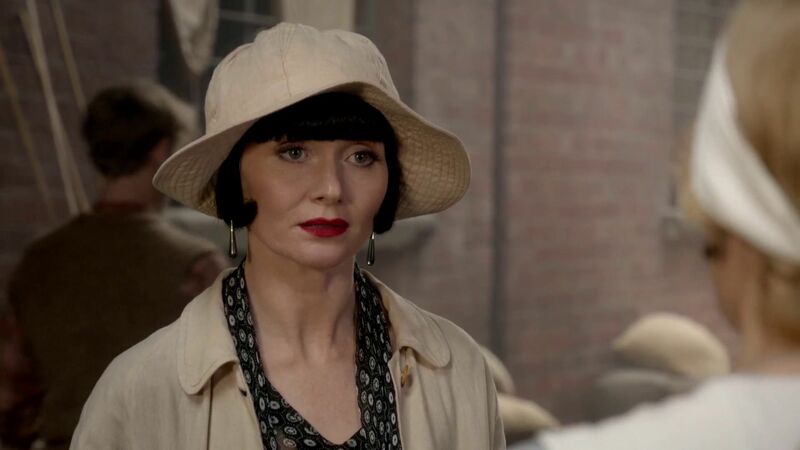 If you’ve read my blog before you may know how much I love the show Miss Fisher’s Murder Mysteries in part at least because of the costumes. 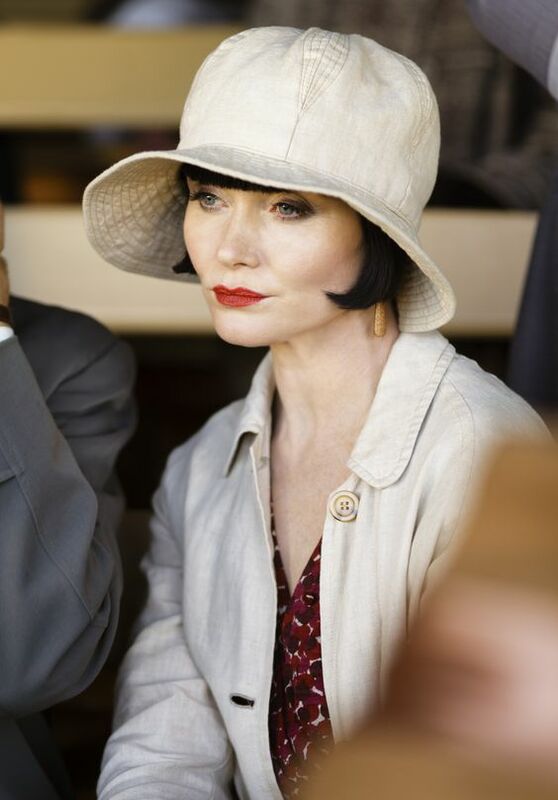 So when Portia announced this year’s Refashioners theme was ‘inspired by’, I couldn’t resist making a costume from Miss Fisher. 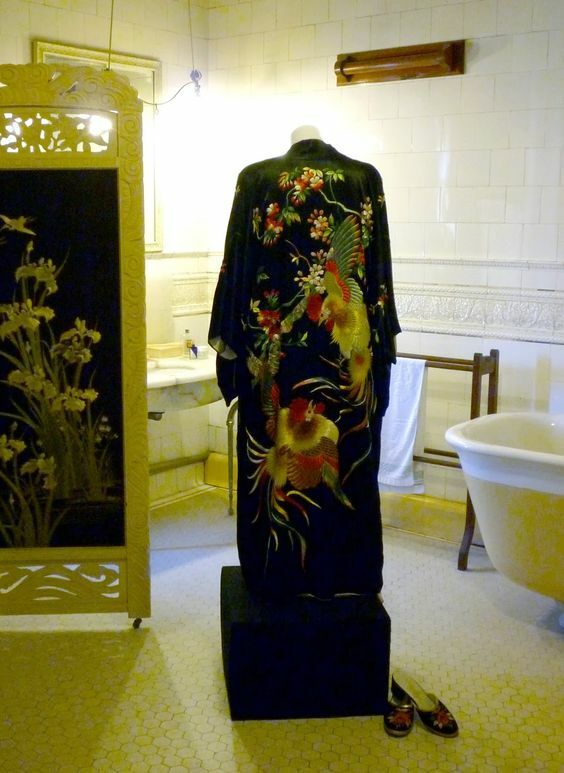 I really wanted to make her amazing silk robe, but I didn’t think my embroidery skills would be up to it (I’ve done embroidery twice and both times it’s been a little rudimentary). 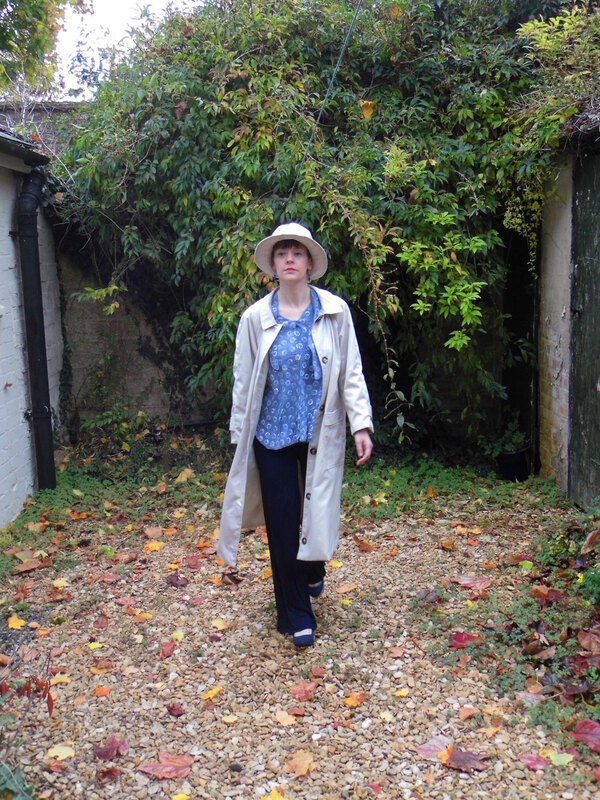 So having ruled out the robe, I then decided to make her signature trench coat and matching hat. 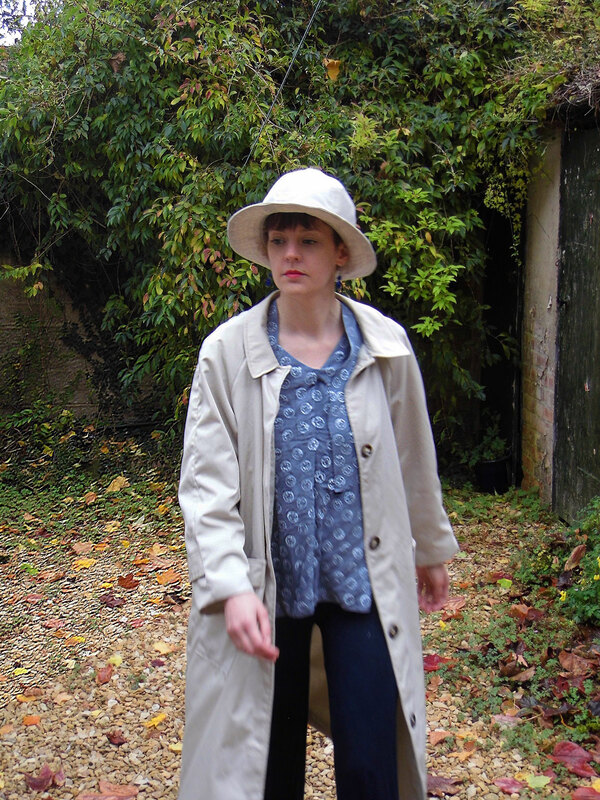 I also made trousers, a blouse and a camisole to go under the coat! Fair warning this is a long post with lots of photos! Feel free to skip to the end to look at the finished look! 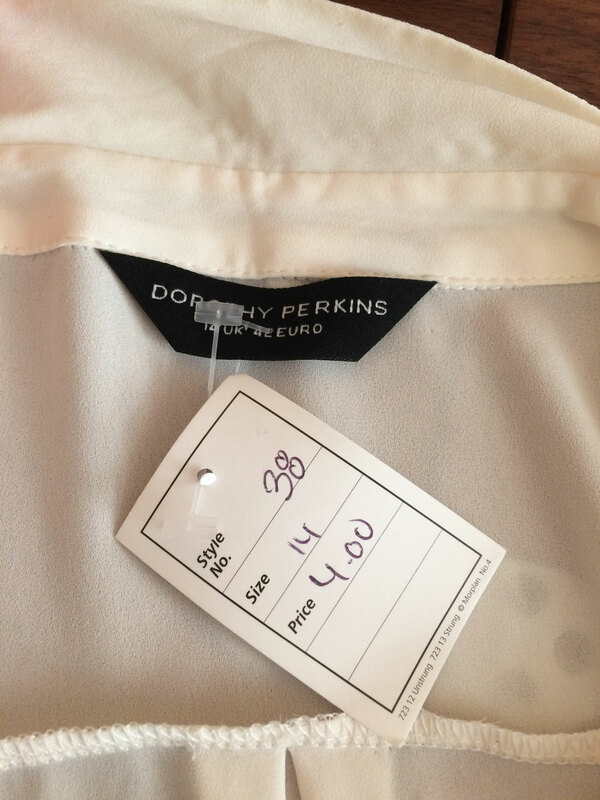 Polyester blouse – I wanted to get a dress to make the blouse, but couldn’t find anything suitable so I had to settle for this blouse. 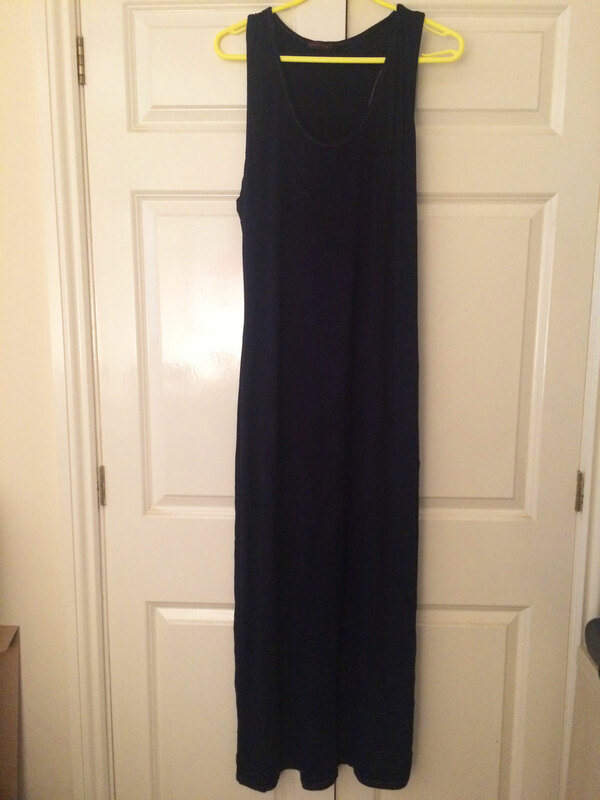 First I dyed the dress navy blue – it was mostly viscose so the normal Dylon hand dye took quite well and it didn’t matter that it was beige. 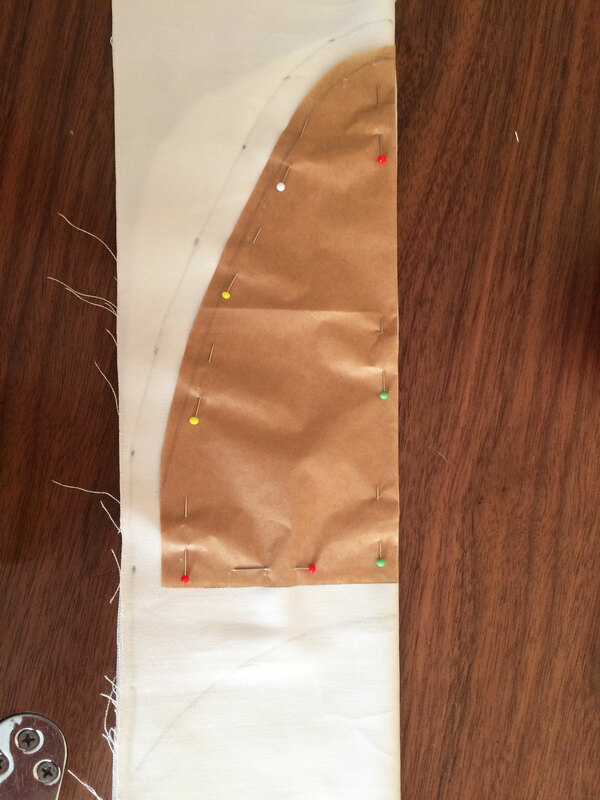 I then sewed 2 parallel lines from the hem upwards, with the right sides together, to roughly where my crotch was when I held the dress up with the hem on the ground. 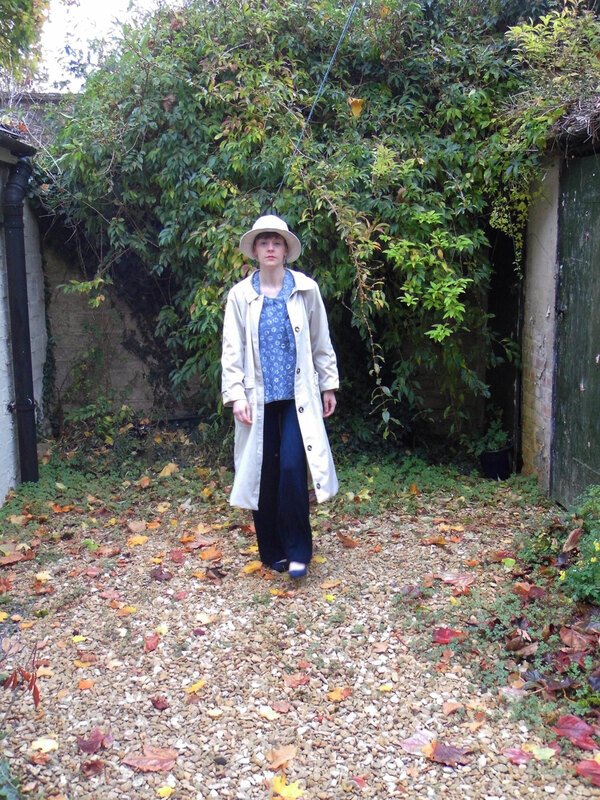 I then cut between the 2 lines and voila, I had trouser legs! 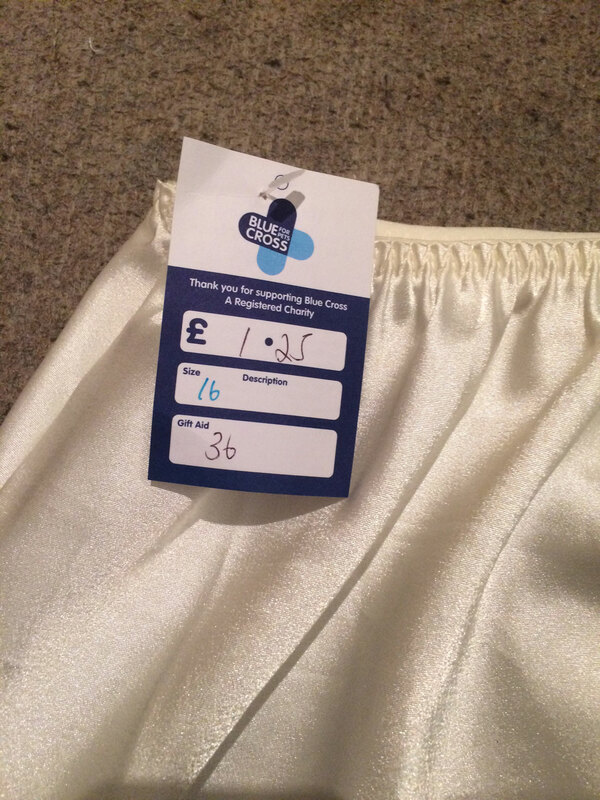 I then tried them on, sewed a better bum curve. 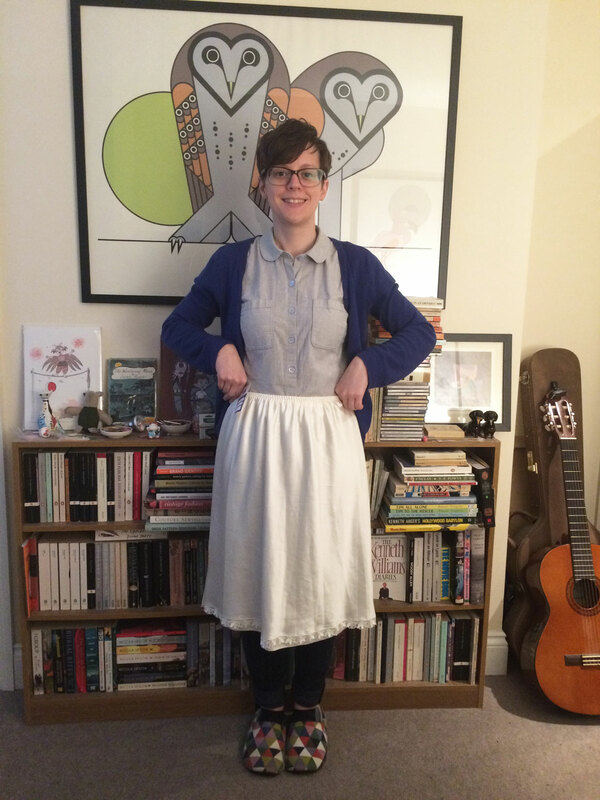 I then sewed a large hem channel at the top and threaded some elastic through – I know elasticated waisted trousers are not super accurate for Miss Fisher, but these will become my ‘lounging around the house’ trousers, so at least they’ll get some more wear! 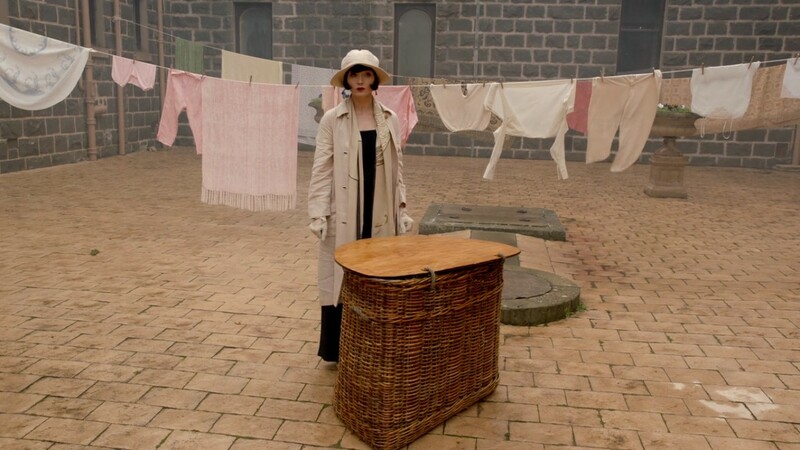 Again, I started by dying the skirt – I put it (and the blouse) in the same dye as the dress, knowing that because they were both synthetic that the dye might not take as well, but it didn’t take at all! Luckily Instagram came to my rescue and a couple of people told me about Rit Dyemore Synthetic dye. I ordered this in navy blue (to match the trousers) but this was as dark as it went. 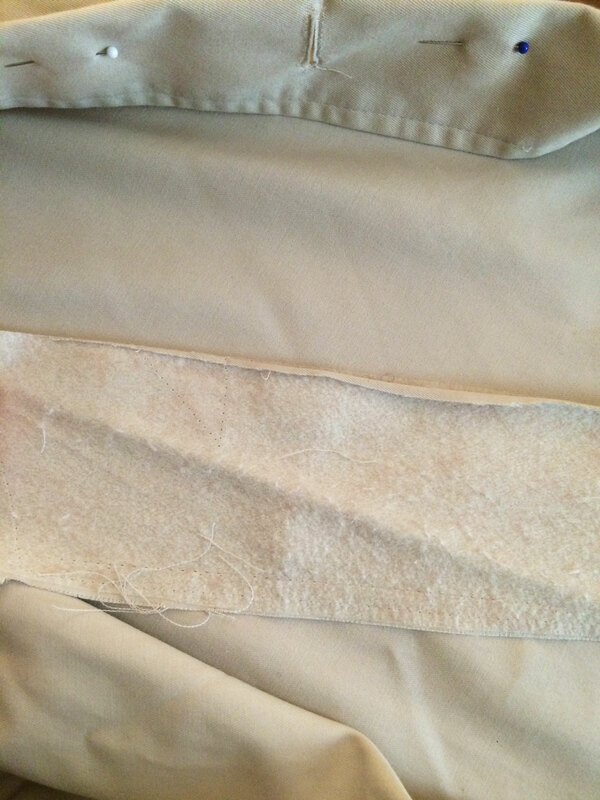 First I cut off the elastic, and saved it in my stash to use on another project in the future. 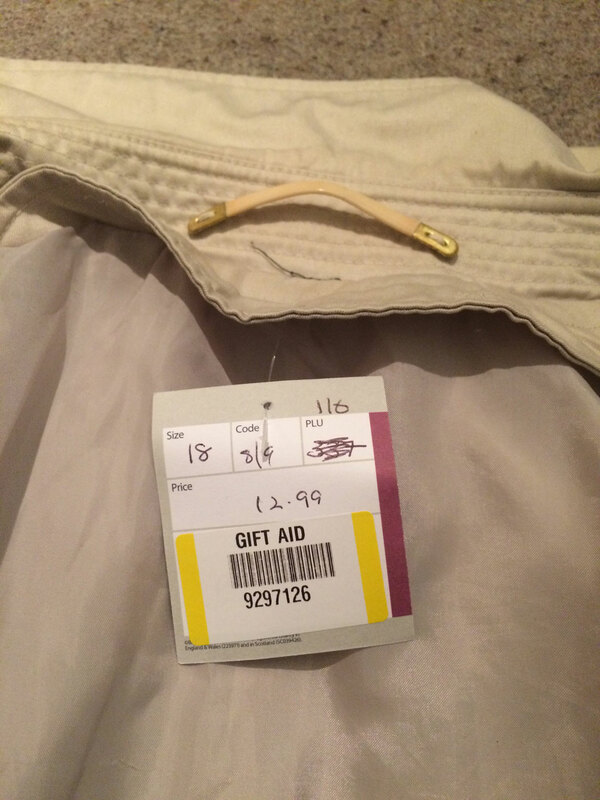 I turned the skirt upside down, so the lace on the hem was at the top. 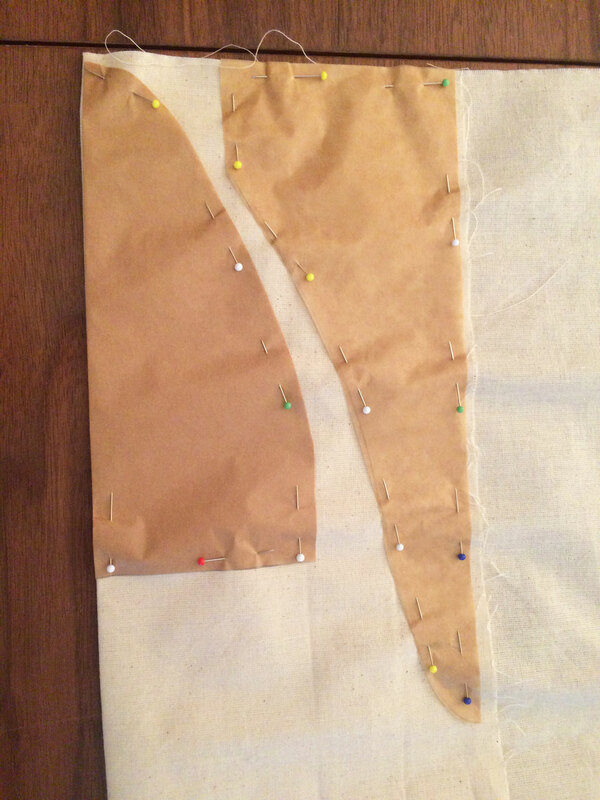 I then pinned and sewed new side seams and trimmed off the extra fabric, to use as the straps. 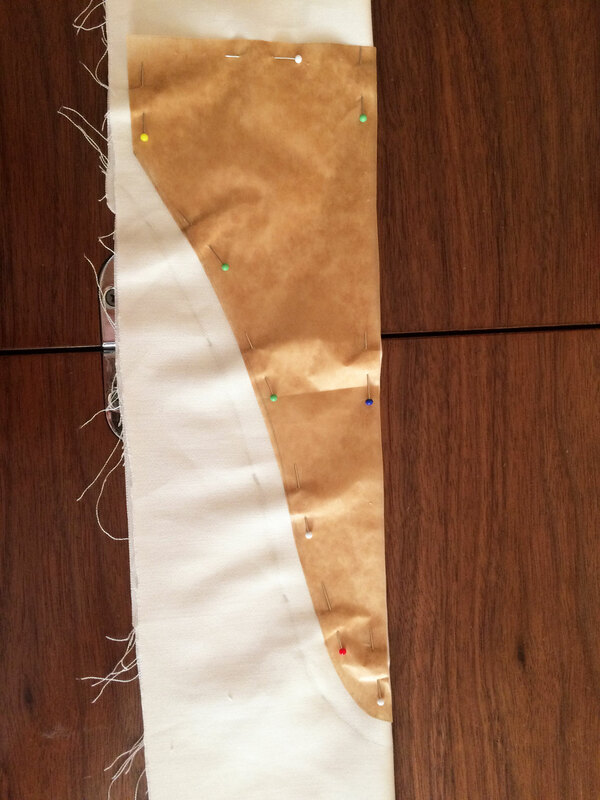 I cut 2 strips 5cm wide, then sewed them with a 1.5cm seam allowance so they ended up 1cm wide. 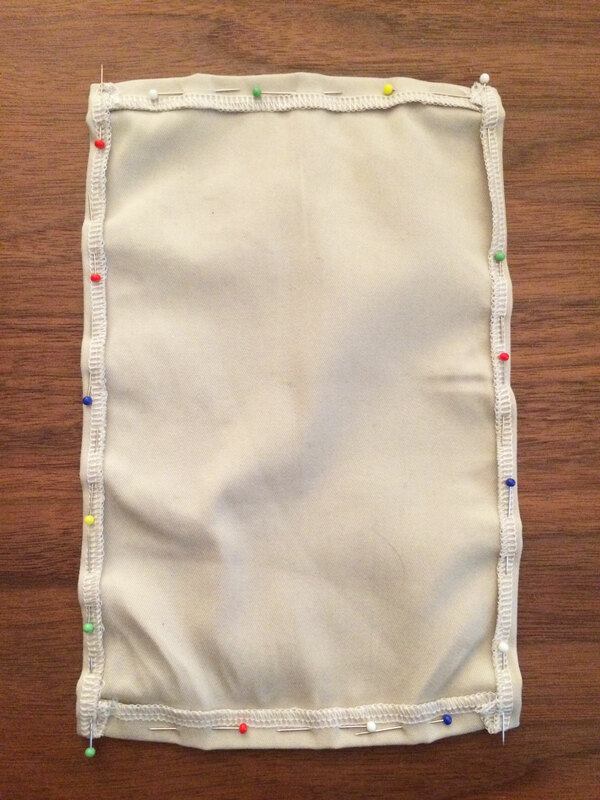 I then stitched the straps on the back, put the top on and pinned the straps where they needed to sit on the front and stitched them in place. 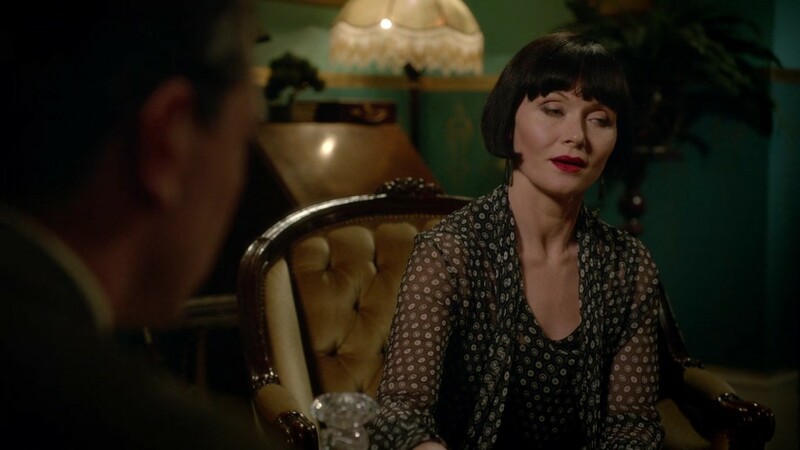 I made the camisole because often in Miss Fisher you can see through her very thin blouses that she is wearing one underneath – I guess it was also underwear in the 20s – but my blouse was too thick to see it so I didn’t really need it, but you live and learn! 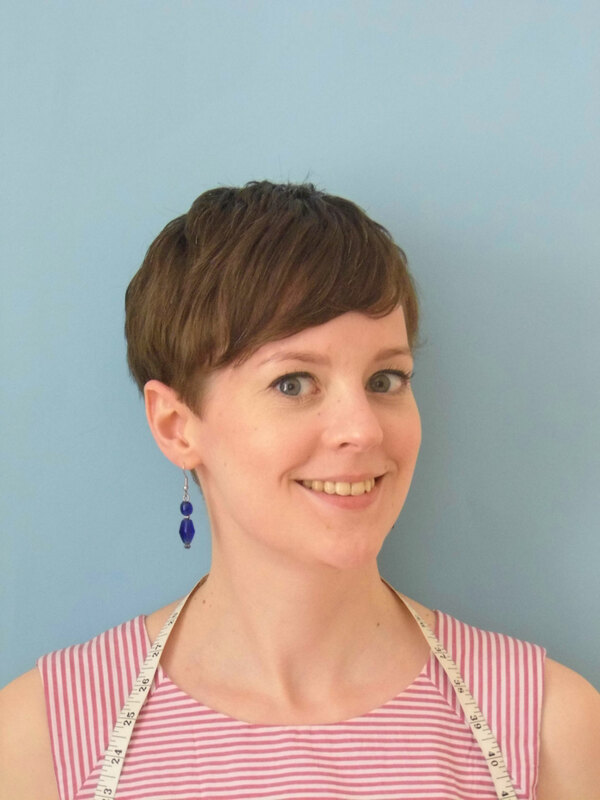 Then after the synthetic dye – which involved cooking the whole lot for over an hour – it looked like this, which was an improvement, but sadly not the colour I was after. 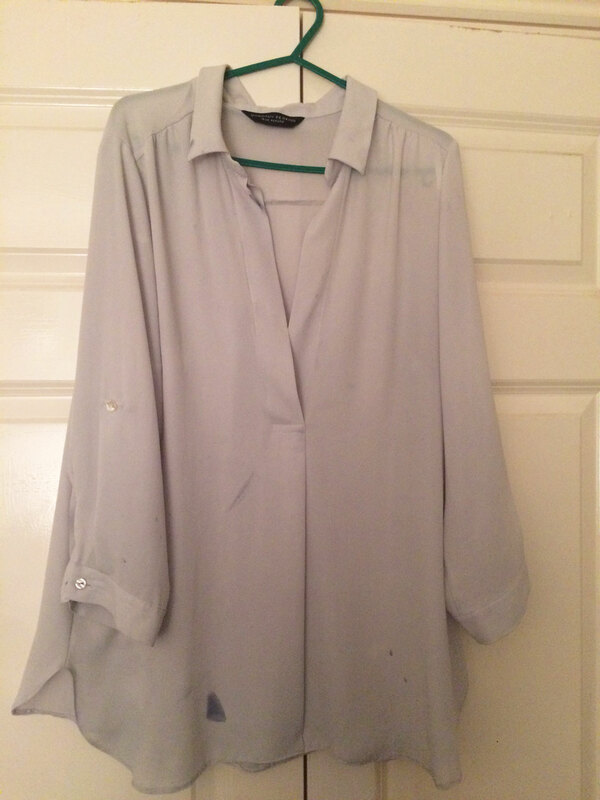 The outfit I was basing it on was black, but I was going for navy but then it was this light grey-ish blue. 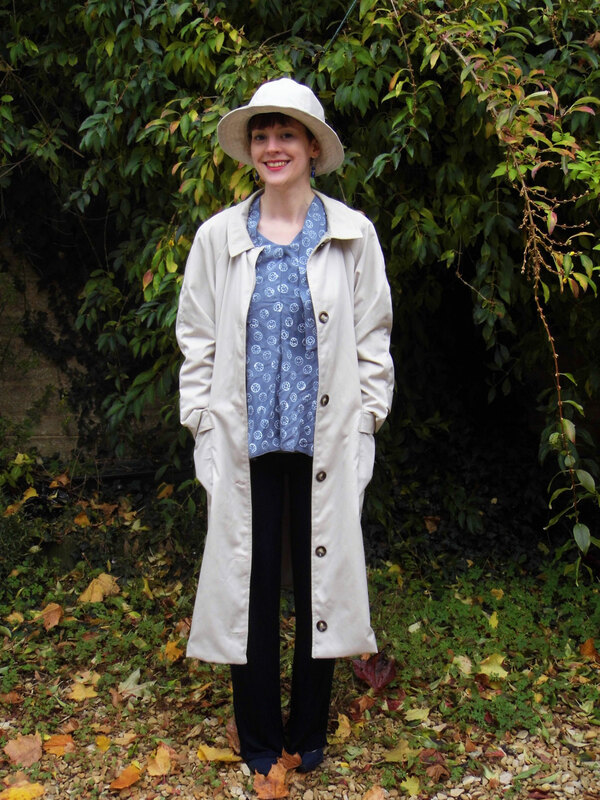 I unpicked most of the blouse – which took a while because it was all overlocked! 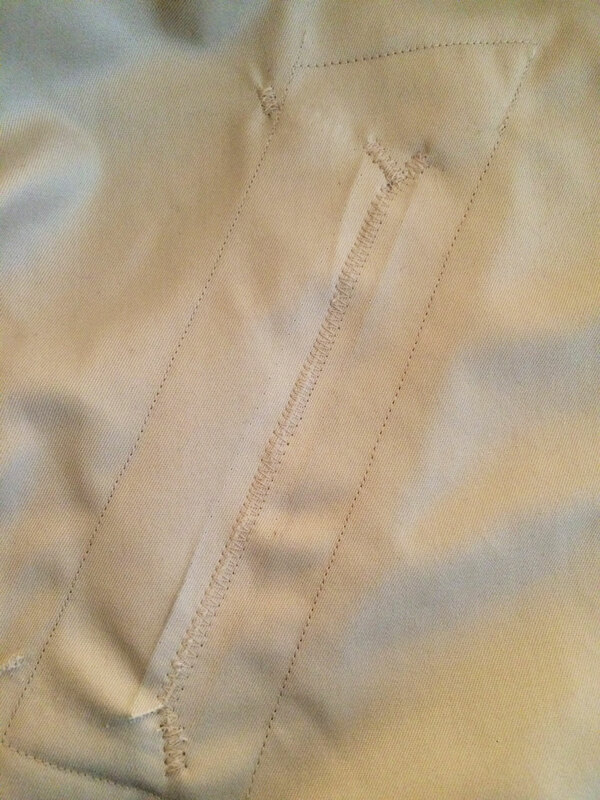 I unpicked the collar and placket, and then sewed a new centre front seam to get rid of the extra fabric from the placket. 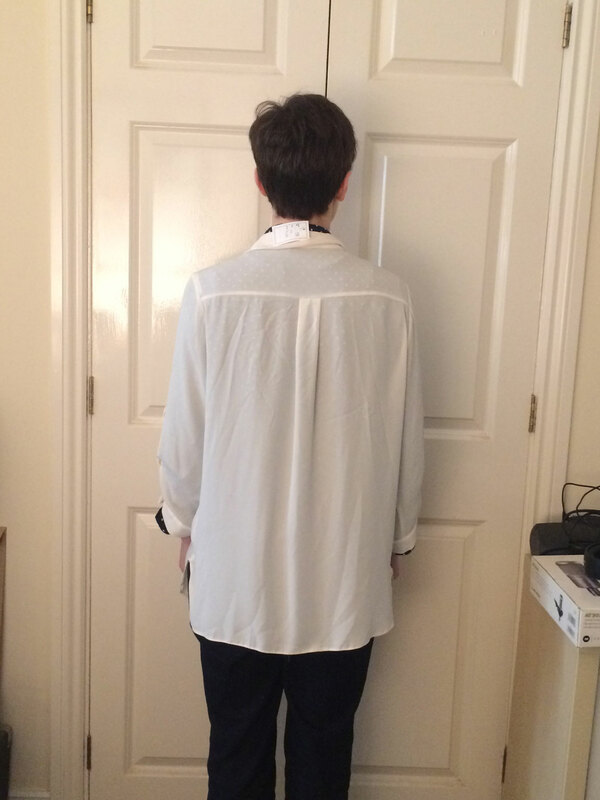 I then used the scout tee as the basis for the new shape of the back and front, but I made the front a v-neck. 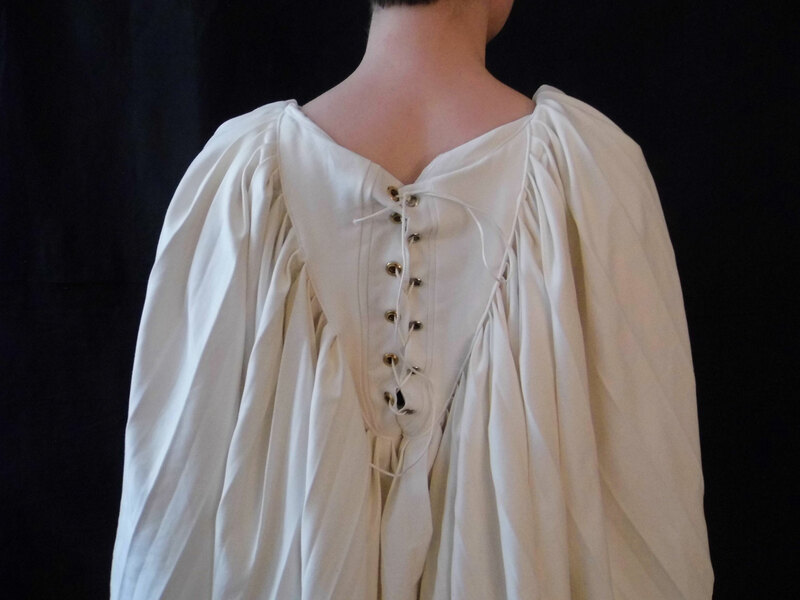 I then sewed the sleeves back in, and used the yoke which I’d removed from the back to make a facing, understitching it to try to make it lie on the inside. 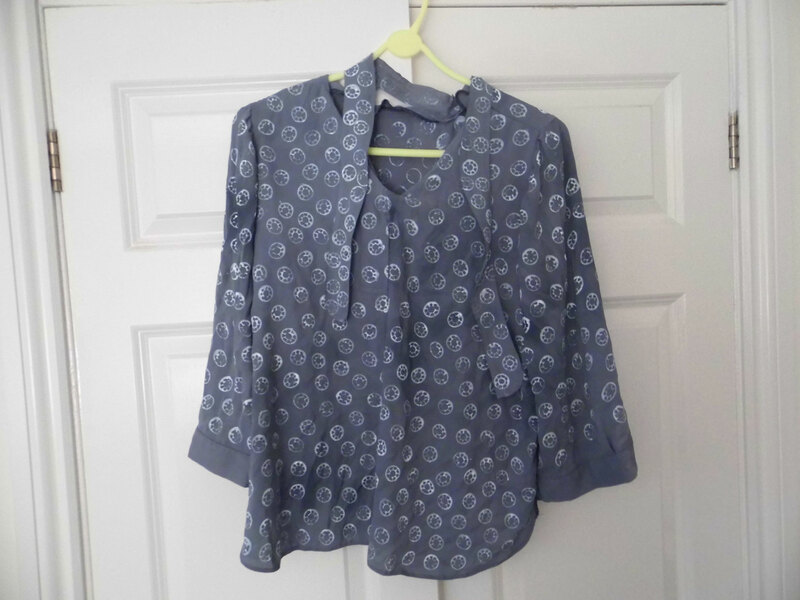 This is the blouse I was basing mine on so I decided to make the pattern on the fabric myself, since I didn’t find a garment with the right kind of geometric pattern on. 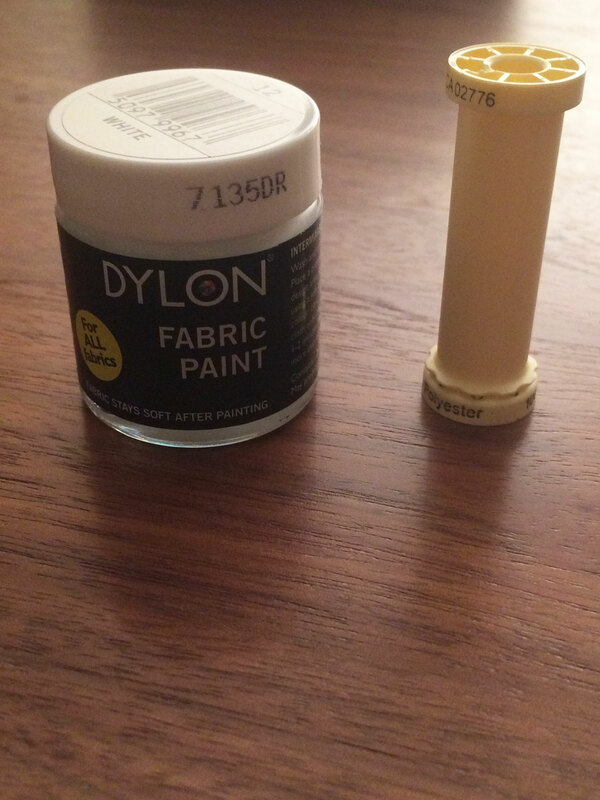 I remembered seeing this blog post on Tilly’s blog by the lovely Zeena Shah so I bought some dylon fabric paint. 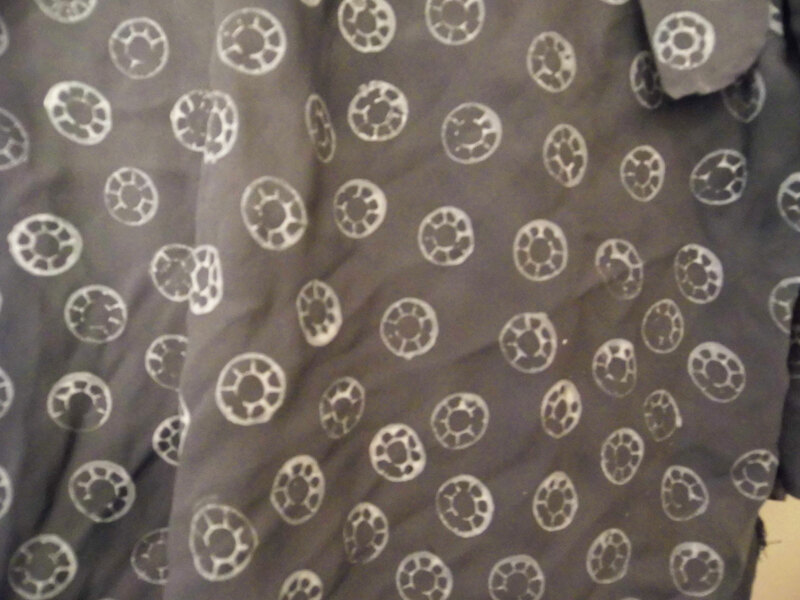 And I thought an empty spool of thread would be the perfect thing to approximate the circles on the original blouse. 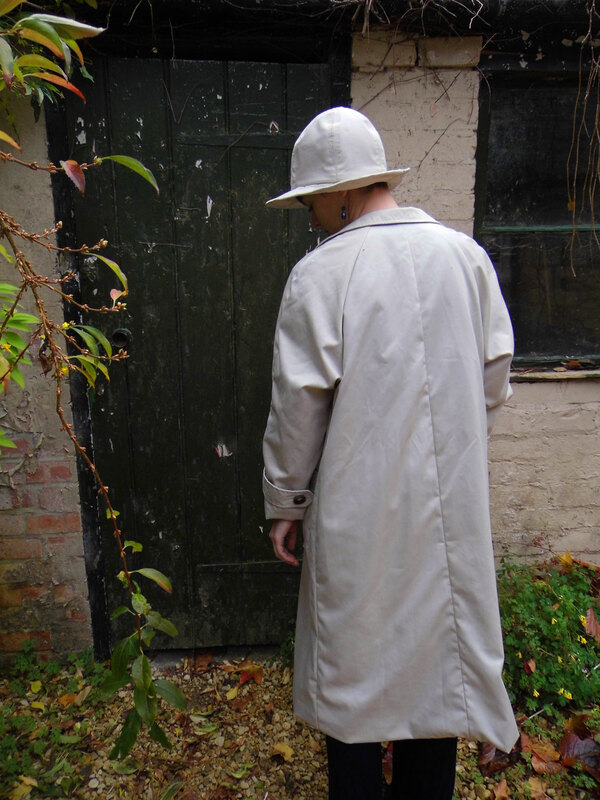 Again, because the fabric was so synthetic, the paint didn’t take as brightly white as it would have if it was a natural fibre, but I think the effect was okay. 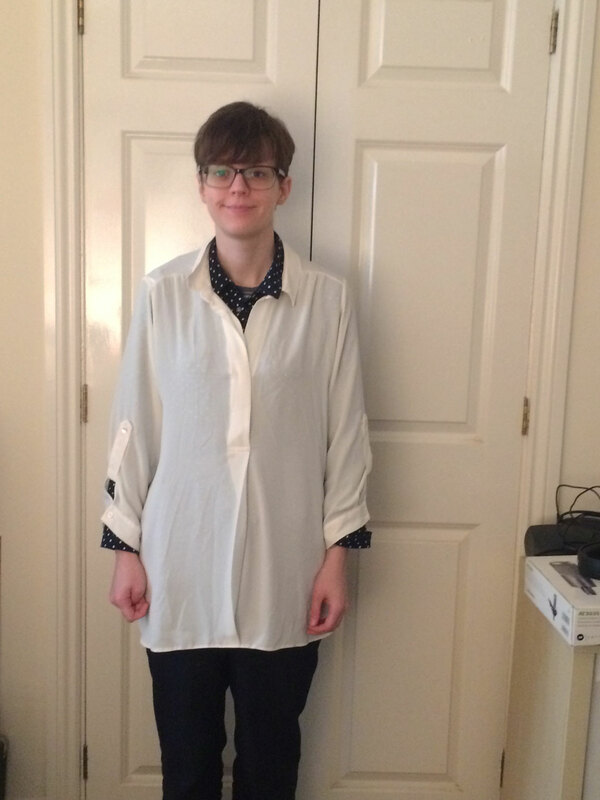 I used the 2 halves of the collar as the scarves down the sides of the blouse, and although it’s the wrong colour, I think it looks okay as a copy. 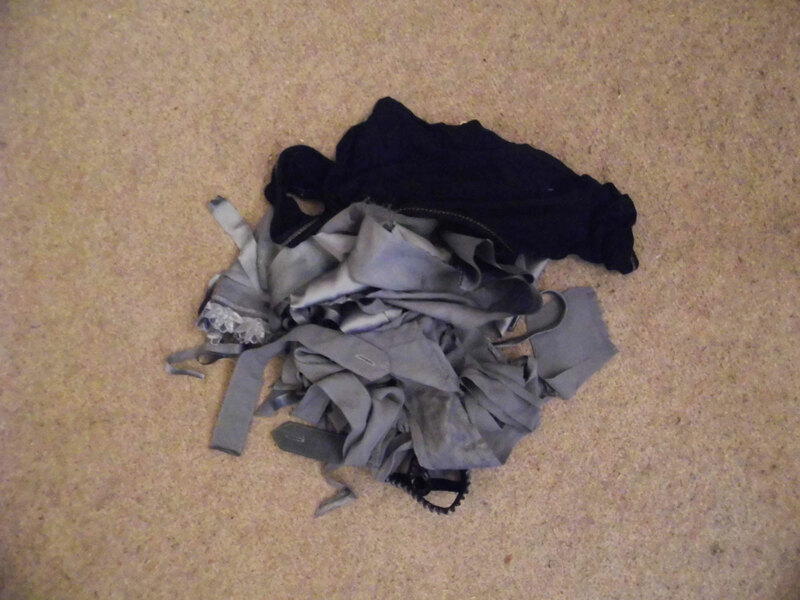 I’m pretty proud of the fact that this tiny pile of scraps is all I had left from the above 3 garments! 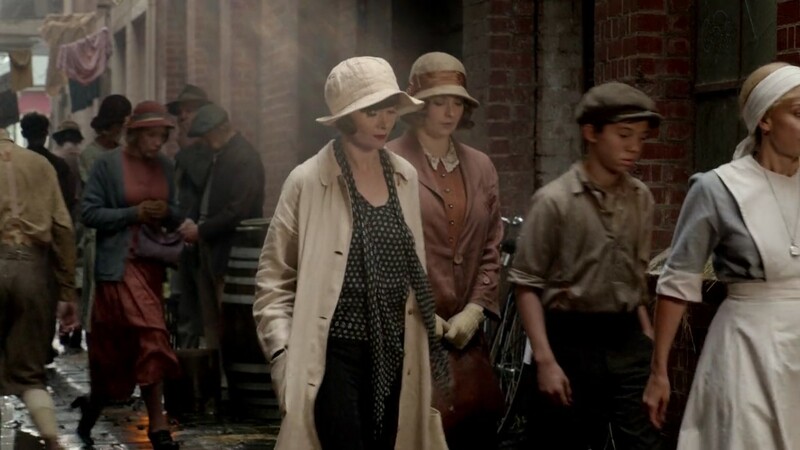 I initially thought I was going to be able to make up a hat by myself, but after doing a bit of research, I discovered someone else had also made the Miss Fisher hat and coat and she used the Sybil pattern by Elsewhen Millinery so I downloaded it and am so glad I did! 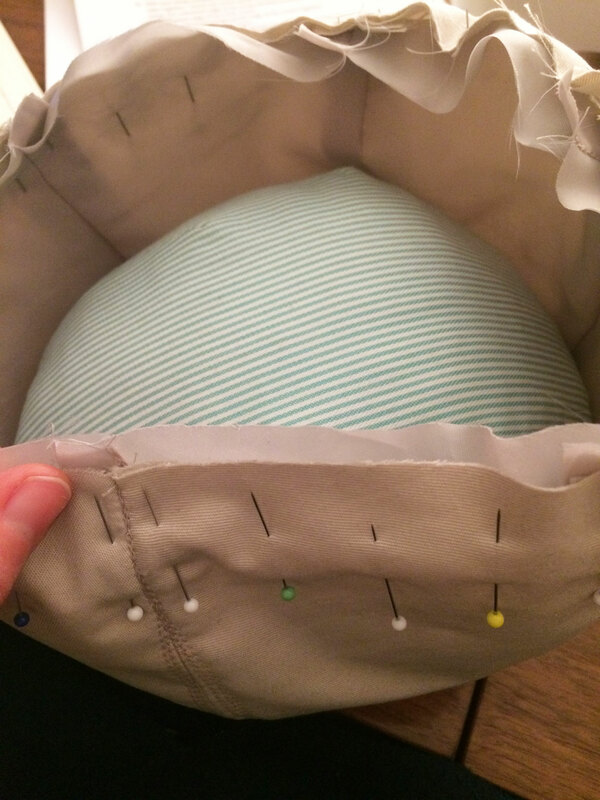 There is a lot of topstitching on her hat – and that was definitely the part that took the longest! That and working out if I had enough fabric to squeeze the hat pieces onto. 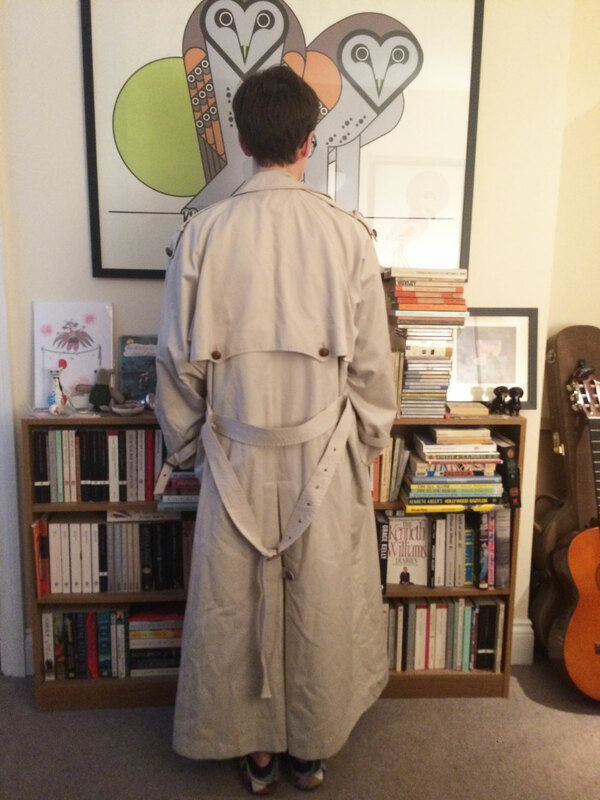 I used every scrap I had – the fabric I cut off the hem of the coat, both lining and main fabric, and the big flap from the back of the original coat. 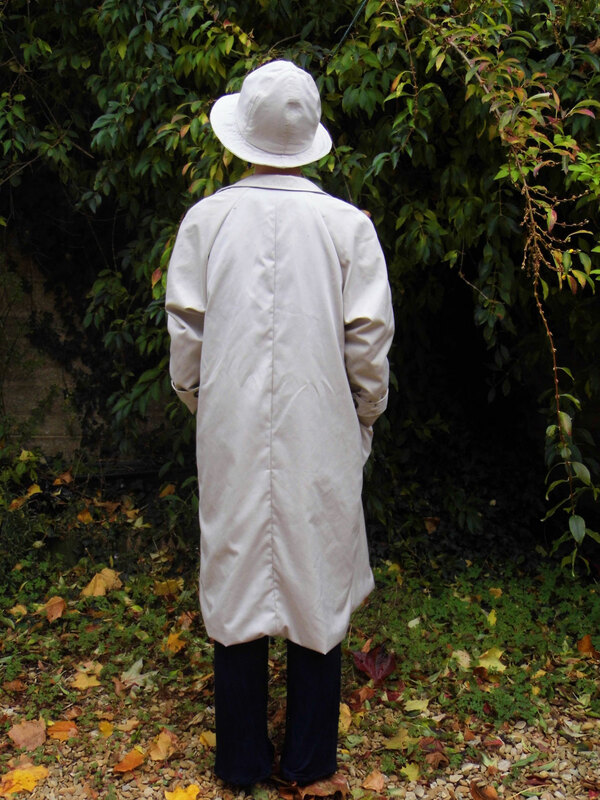 Apart from the buttons on the coat, and the elastic in the trousers, the only other new thing I used was interfacing for the hat. All of the main pieces are interfaced and one side of the brim is. 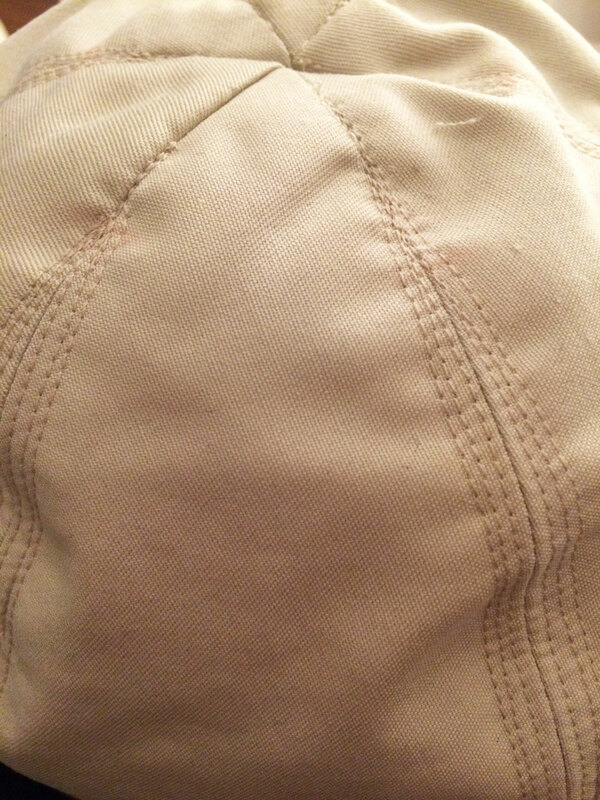 I found my tailor’s ham had an additional use by allowing me to pin the lining to the outer of the hat. The lining overhangs a little, which it’s supposed to. 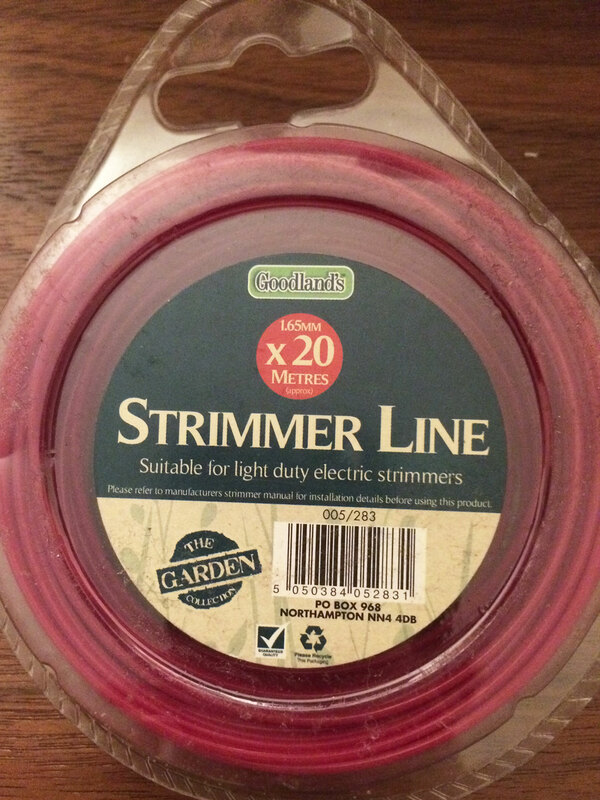 To stiffen the brim a little – I thought it would be too floppy with nothing, but I didn’t want it to be really stiff – I remembered I had this wire stuff from when I made my Doc Brown costume. It was perfect! 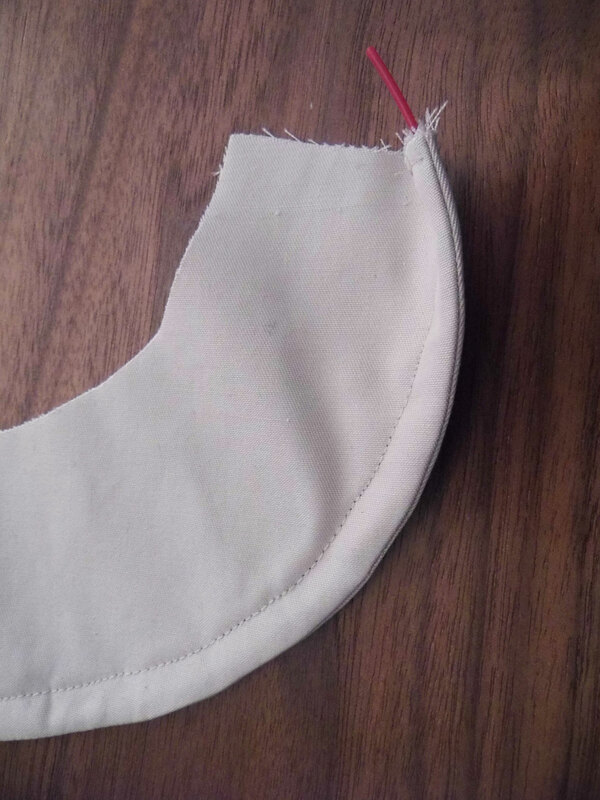 I put 2 rows in and sewed another couple of lines of topstitching, each with a 1cm seam allowance. 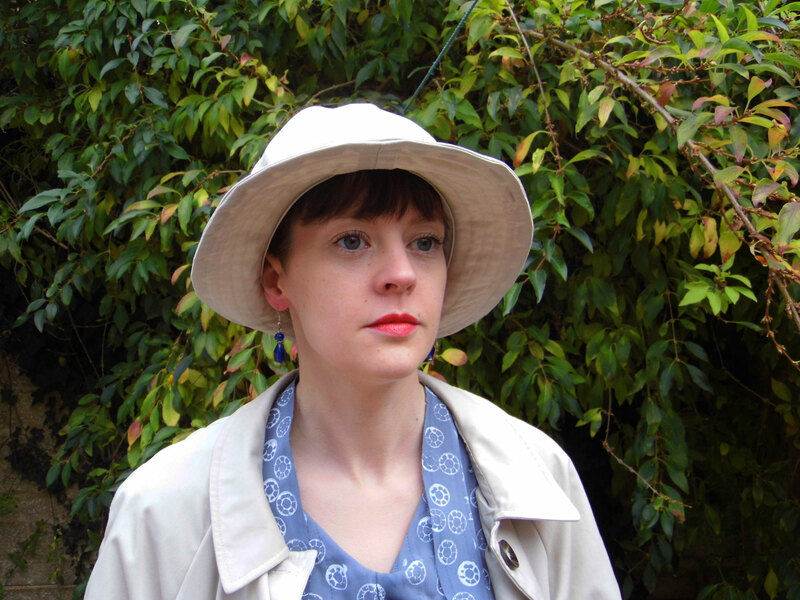 I can definitely recommend this pattern if you want to make a 20s style hat. 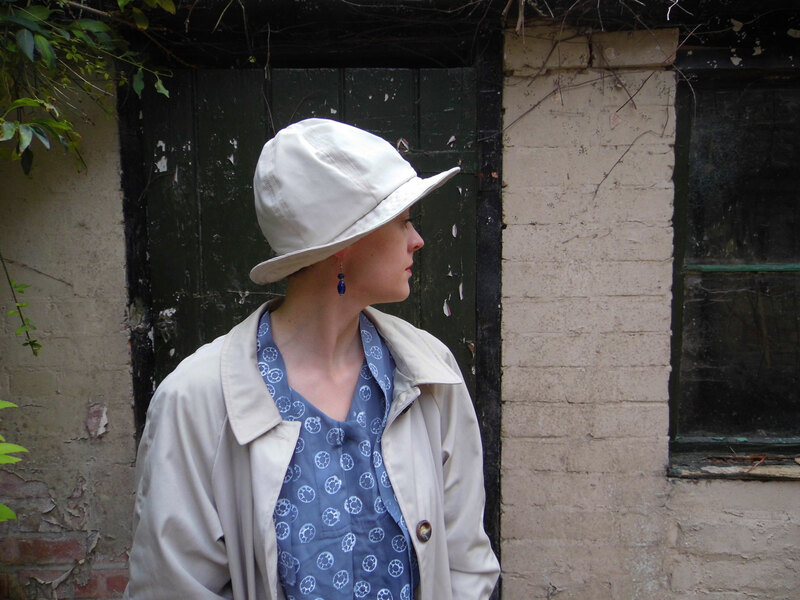 I did make a change to the shape of the brim and made it a bit wider at the back, though it was still a little narrower at the back than the front. 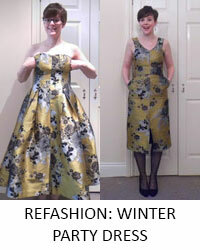 The coat was, obviously, the main task for my refashioners project. First I unpicked everything! I even unpicked the welts from the pockets. 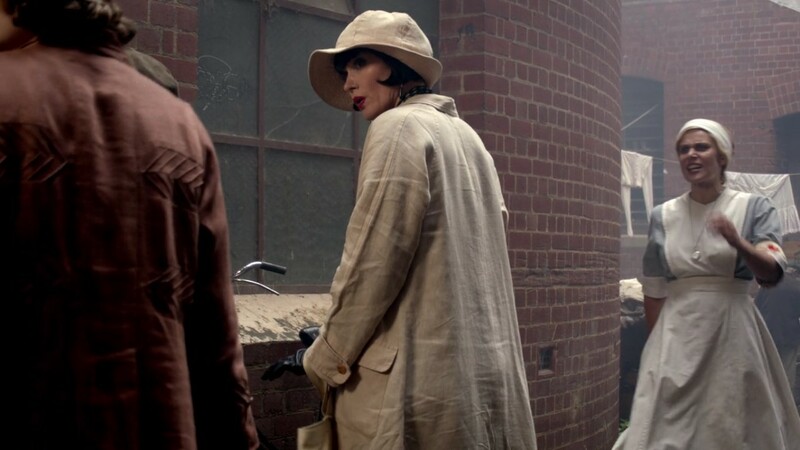 I also unpicked the collar, which it turned out was unneccessary – Miss Fisher’s coat doesn’t have a collar stand, but I thought I would have to resize the original collar since I had resized the rest of the coat so much, but weirdly the collar fitted in its original size! 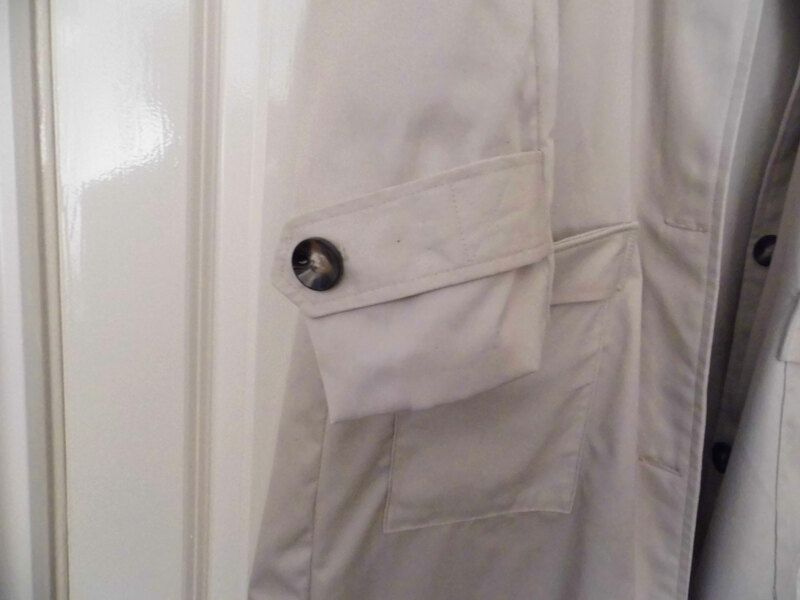 Miss Fisher’s coat has big patch pockets, so I placed some fabric behind the holes from the welt pockets to try to repair the holes – knowing the holes themselves would be covered with the patch pockets. This is what it looked like from the front when I’d finished the repair. 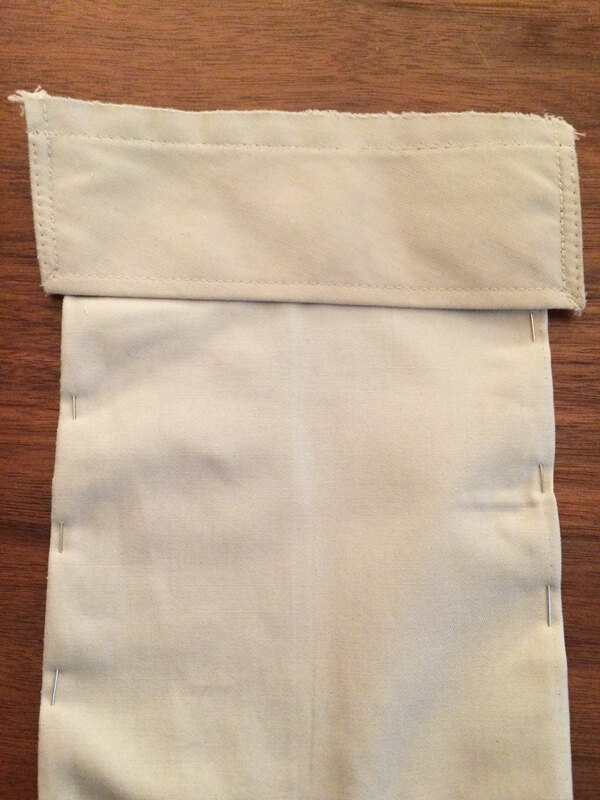 I then made new pockets from a piece of the coat which I no longer needed – I can’t remember what it originally was, though. 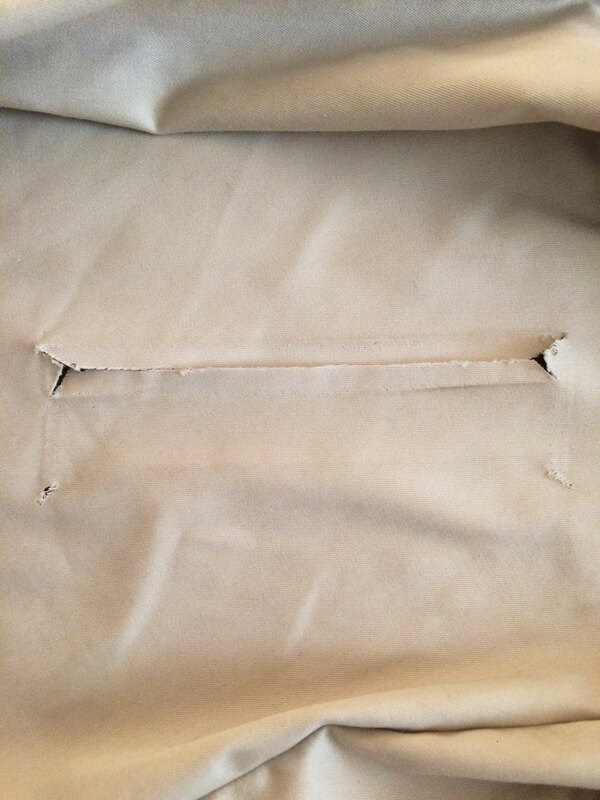 I used the original welt from the pockets as the flap on the top of the new pockets – handy! 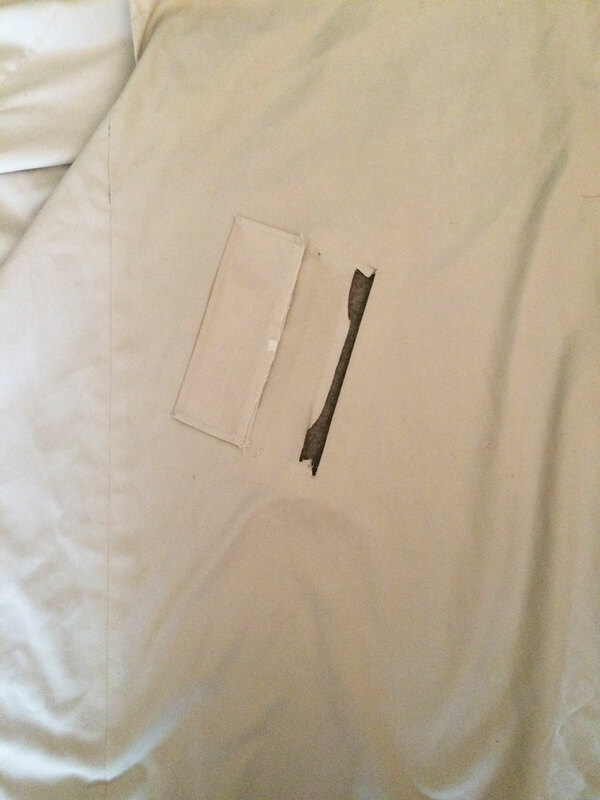 resewed the back seam, removing the excess fabric from the original vent, with an extra 2cm taken out. Stitched the raglan sleeves back in, with an extra 2cm seam allowance at the front and the back. Stitched the underarm and side seam, as one, with an extra 2cm seam allowance, then stitched again with another extra 2.5cm. 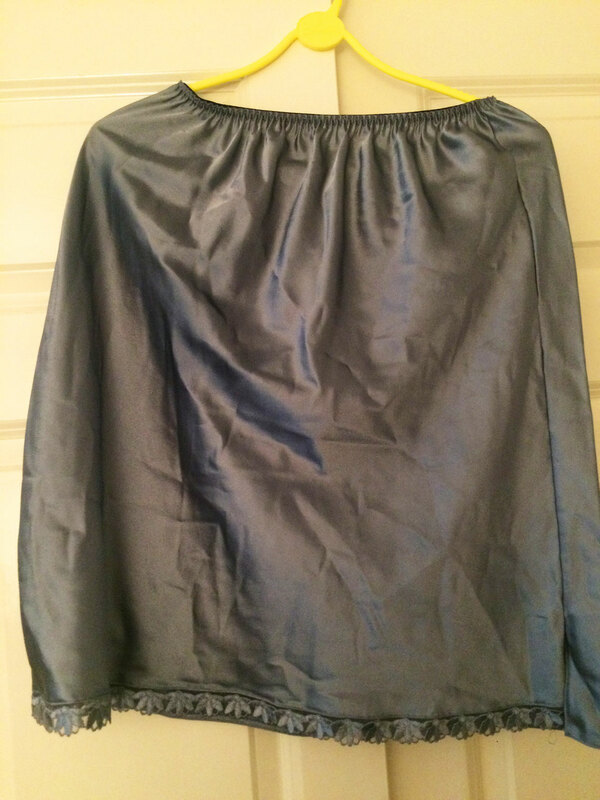 I did all of this with the lining too, though it had set-in sleeves instead of raglan sleeves. 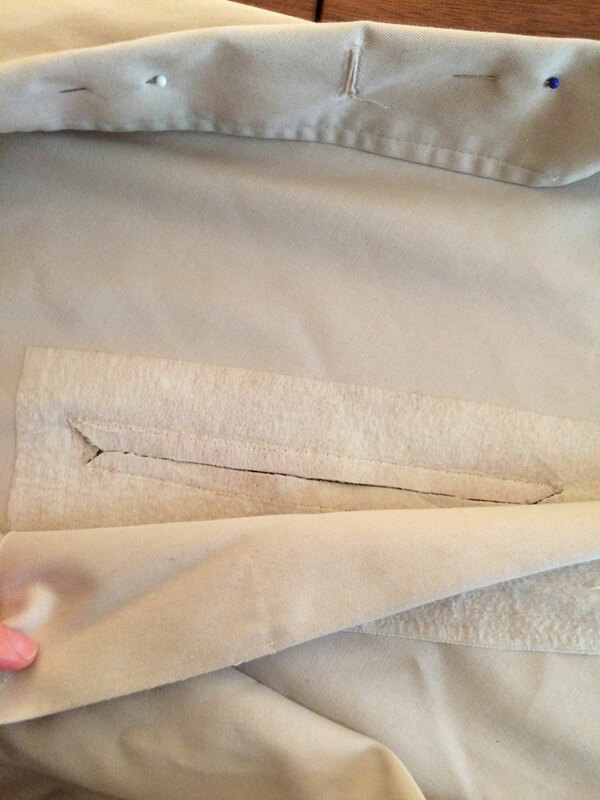 I cut 7cm off each of the coat fronts and off the facings, and then stitched the facings back on. 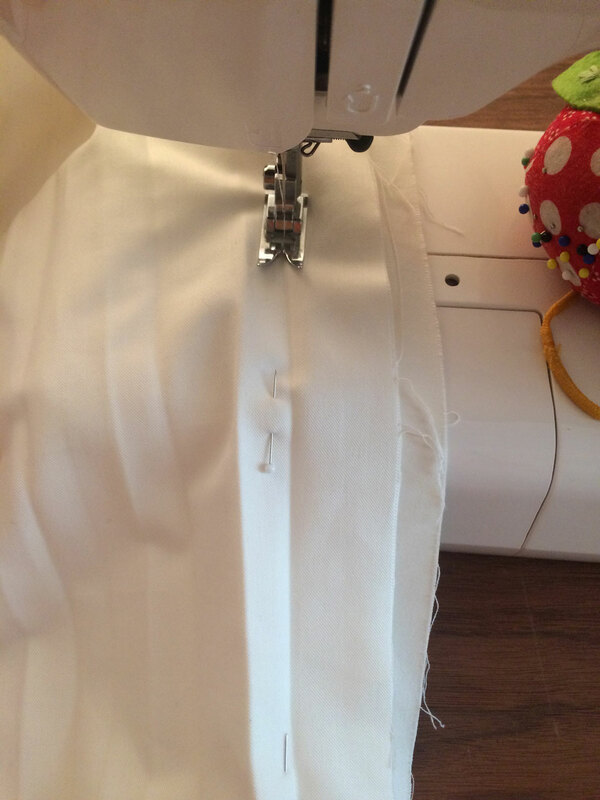 I ended up cutting off all the original button holes, which was handy! 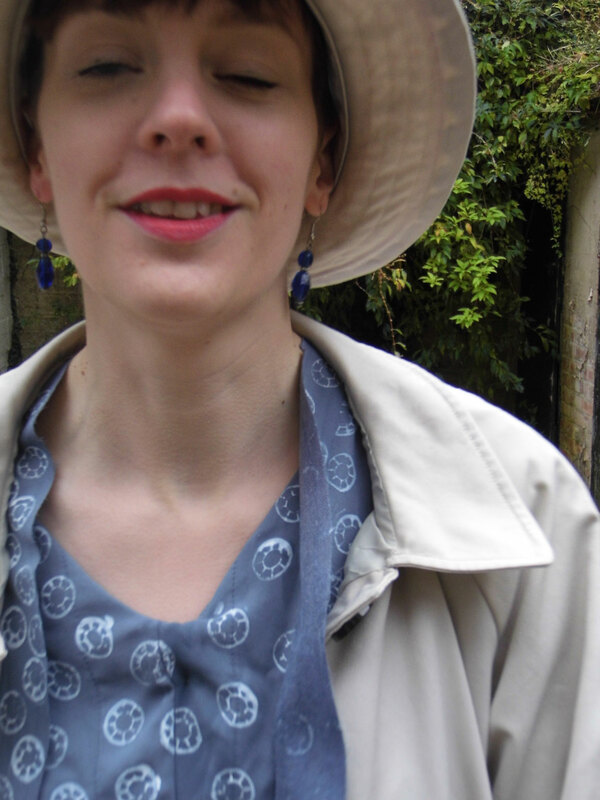 I then reattached the collar. 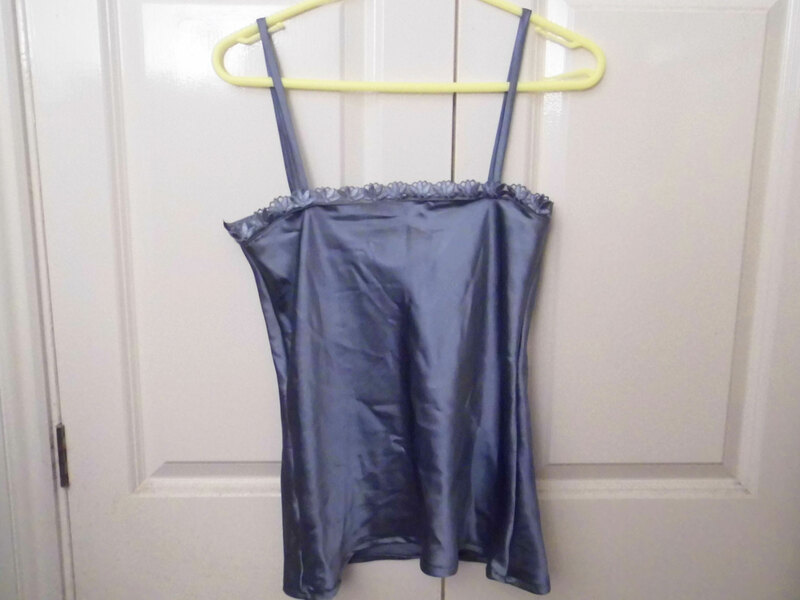 I then sewed the lining back in, fudging it where it didn’t quite fit any more – It miraculously did fit quite well, it was just at the front where I had changed it from double breasted to single breasted, where it needed some tweaking. 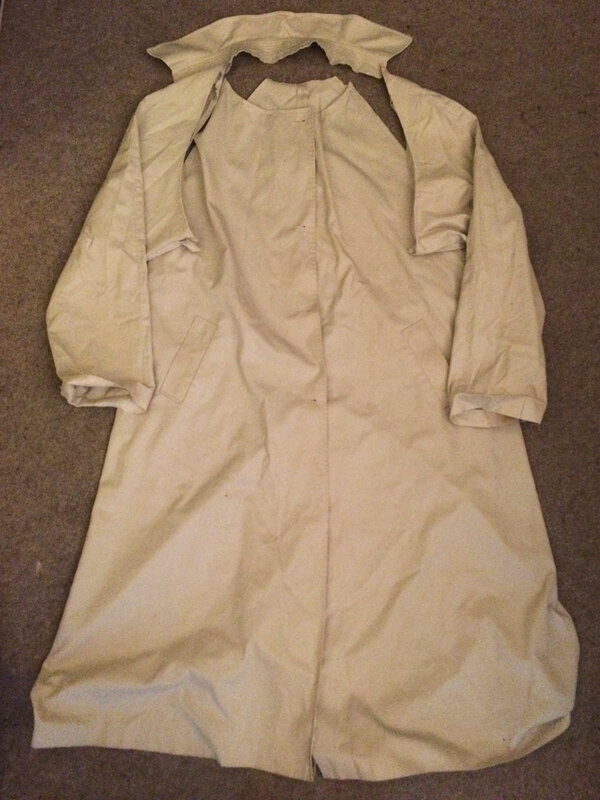 I cut 23cm off the length of the coat, off the shell and the lining, then bagged it out. 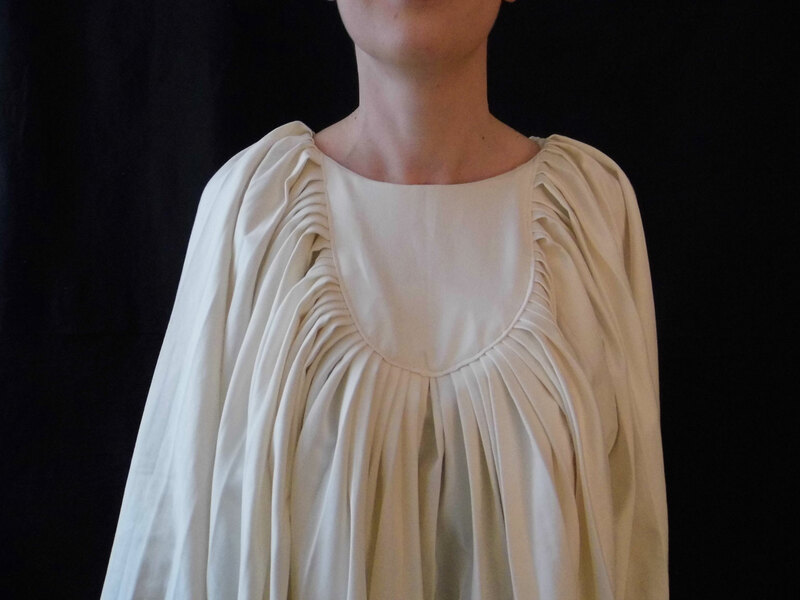 I cut 8cm off the sleeves and used the great Grainline method for attaching sleeve linings and shells. I also used the original shoulder tabs as the tabs on the cuffs of the sleeves. 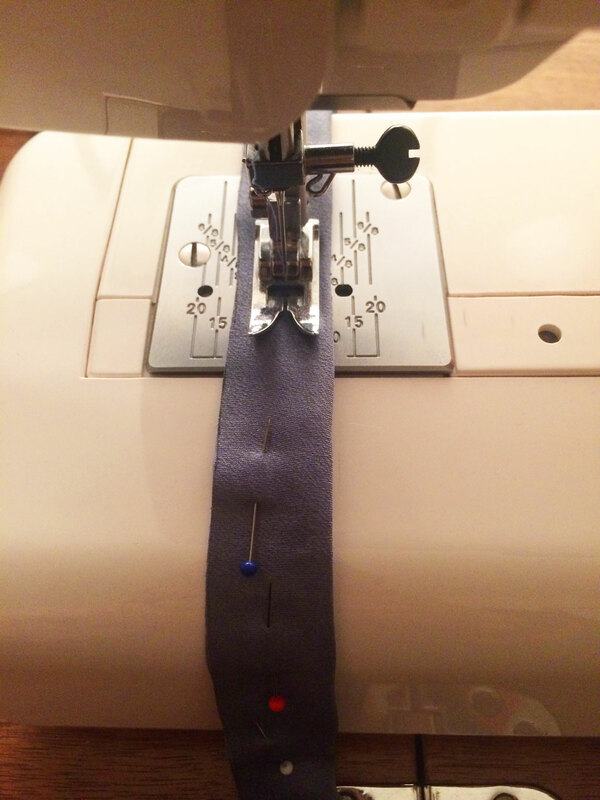 The final things was to make new button holes and sew on the new buttons, which I got from my local sewing shop. 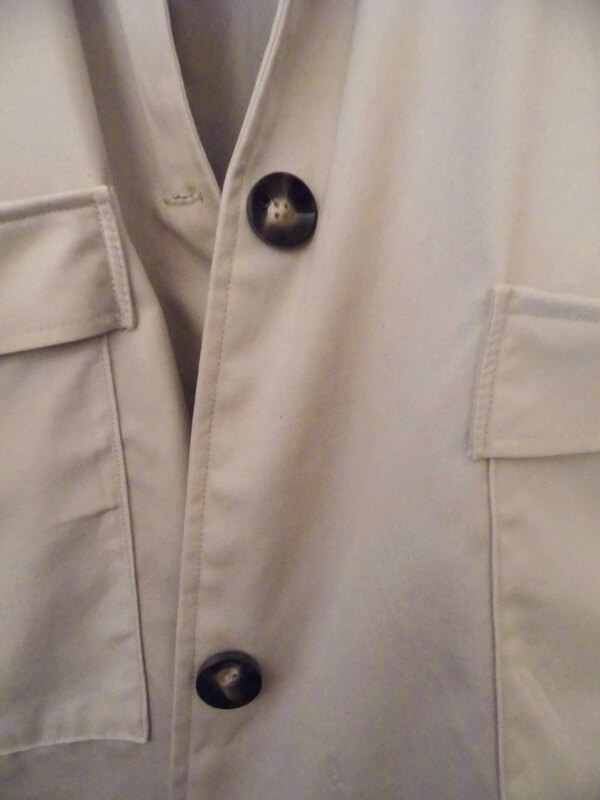 This is all I had left from the coat and hat refashion. 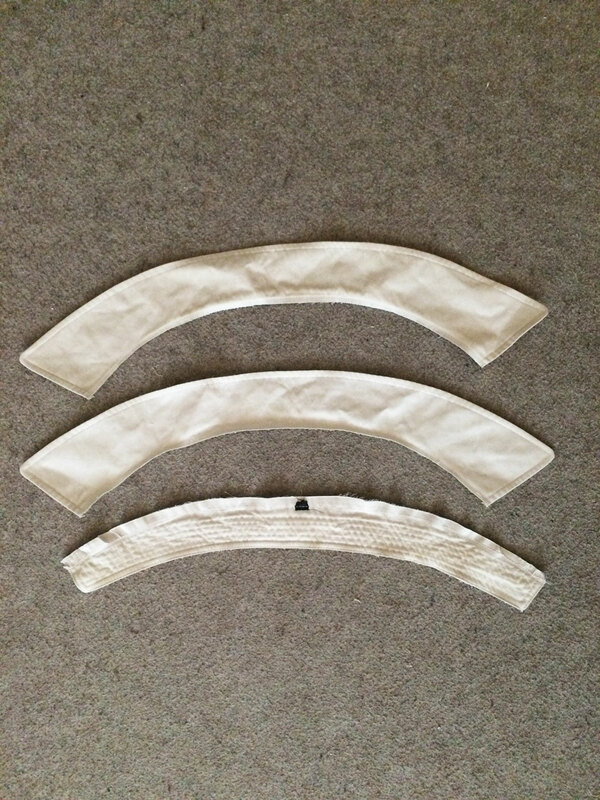 There is a bit more than I thought, but it’s mostly thin strips which I shaved off each seam, and some bits left over from the larger pieces after cutting out the hat. Not bad, though, I don’t think! Phew! If you’ve read all of that, you deserve a medal. If you’ve skipped ahead to just look at the photos, I don’t blame you! 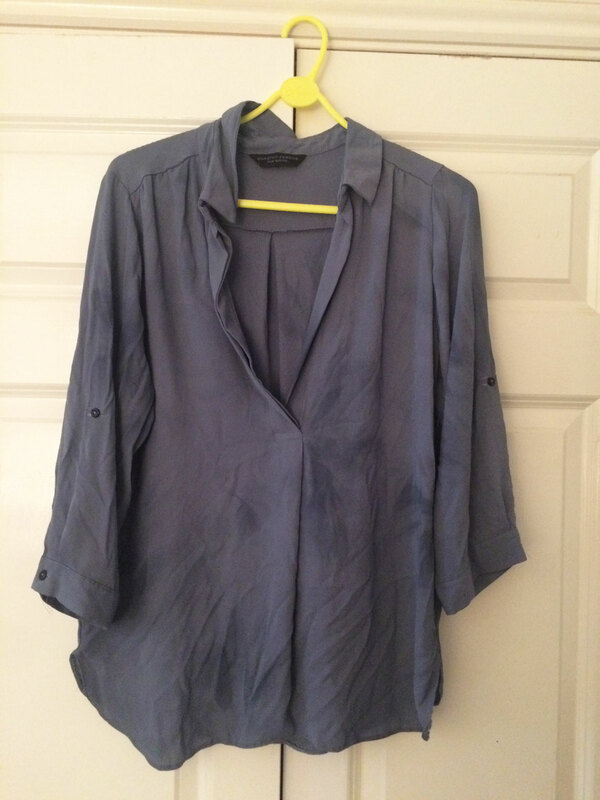 I took the blouse off so you could see the camisole underneath, but it looks so, so wrinkled – sorry! 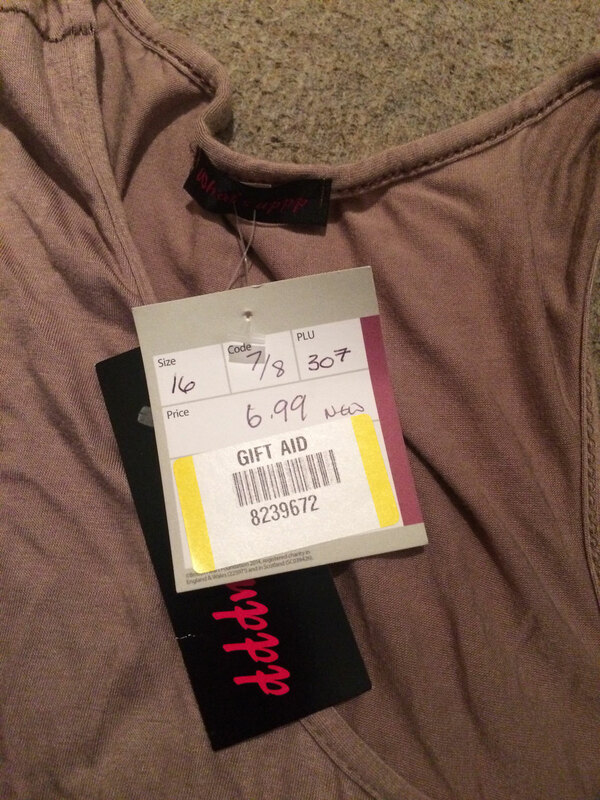 It was actually sticking to me, it’s so synthetic, so it may not be a top that gets much wear when it’s hot, but it would be good for layering when it’s a bit chilly. 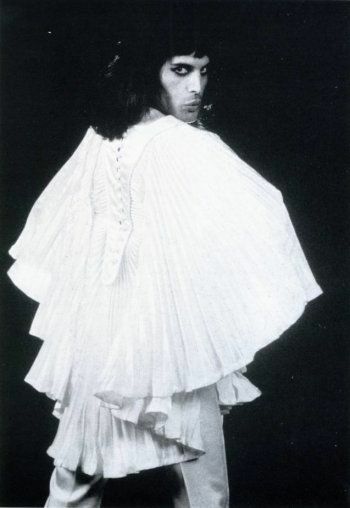 I couldn’t not have an outtake from all the ‘walking towards the camera’ shots. You. Are. Welcome! I really didn’t mean to be posting this so close to the deadline, but I’m not surprised! Everything always takes me longer than I think it will. 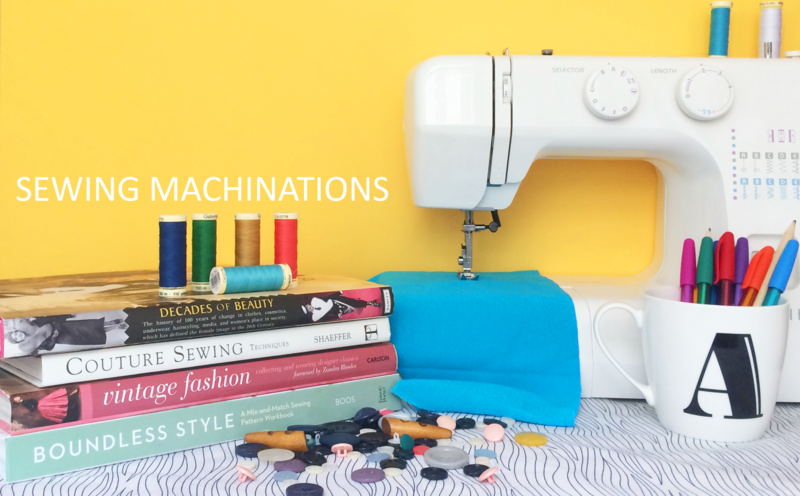 Did you do a refashioners project? 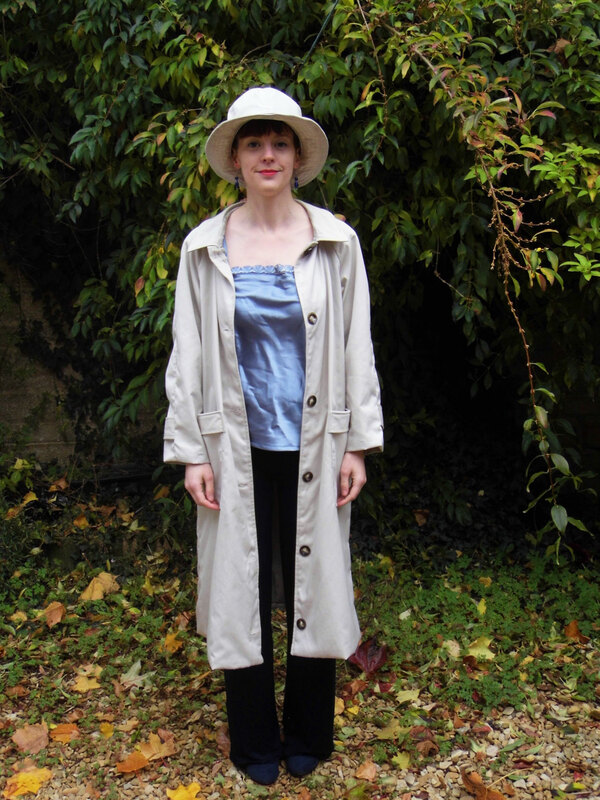 Over the Summer I was invited to a 70s party with the brass band that I play in – and it was the perfect opportunity to make my first Hundred Years Wardrobe make. I had the idea for this project at the beginning of the year, but thought I wouldn’t have time to make anything so shelved it until I had the chance to make a 70s outfit. 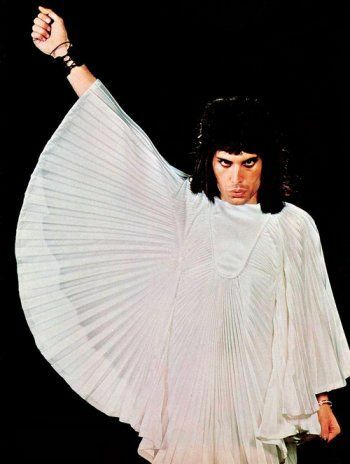 I wrote a post about 70s fashion quite a while ago so I knew there were loads of trends to choose from – hippy, disco, punk, flares being obligatory. I did what I usually do when faced with something like this – went to Pinterest and searched for some iconic 70s figures to get some inspiration. I was pretty close to doing a Bowie look (but which one?!) 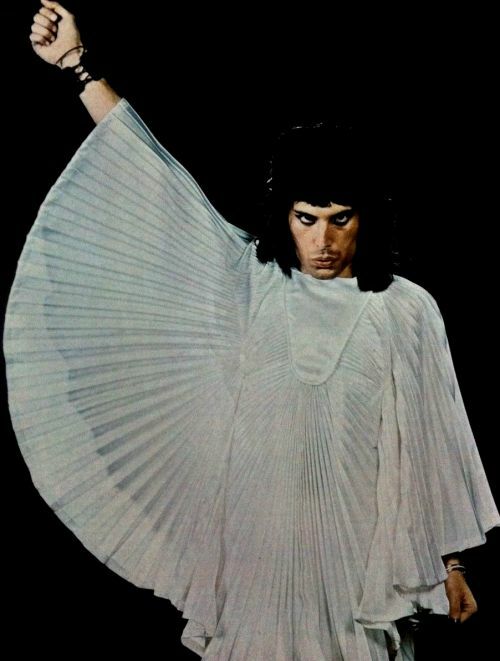 but then I happened upon this amazing Zandra Rhodes outfit worn by Freddie Mercury and my mind was made up – I’ve always loved queen and thought what better outfit than this! 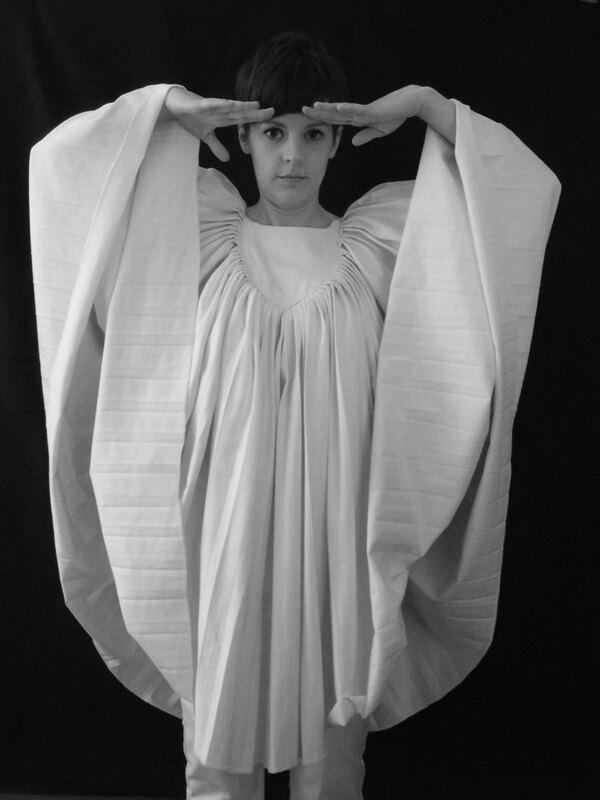 This was made by Zandra Rhodes and I thought it looked relatively simple to make – I would just have to master pleats! 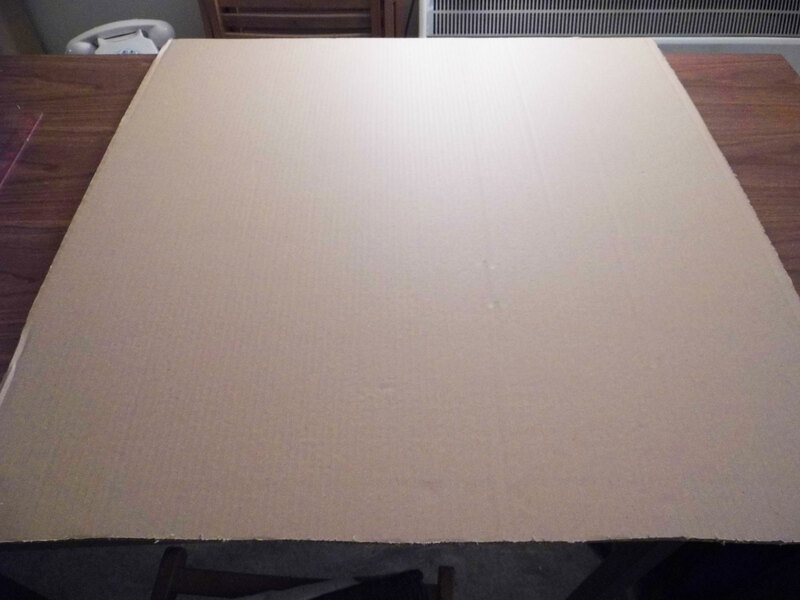 I started with this really big, thick piece of cardboard I got from work and thought it would work as a pleating board, but in fact it was too thick. 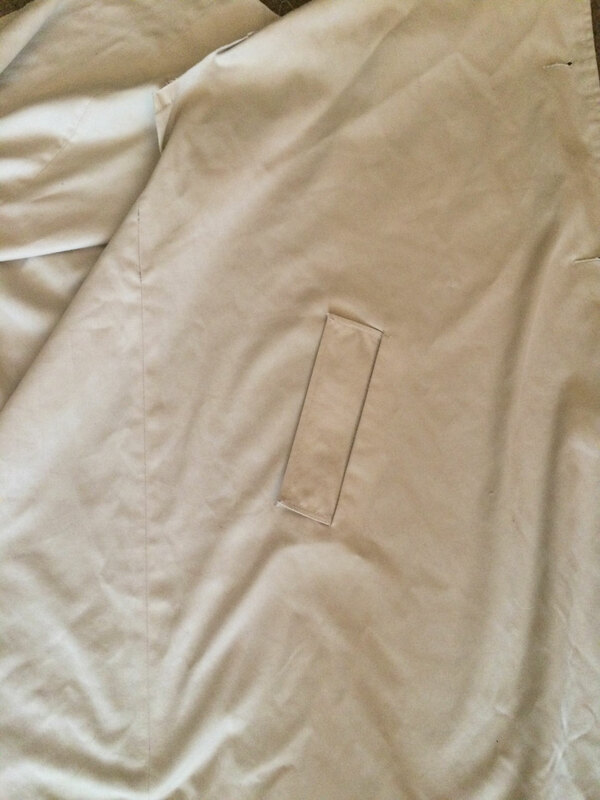 Instead, I used a piece of thick paper/thin card I already had and it worked much better. 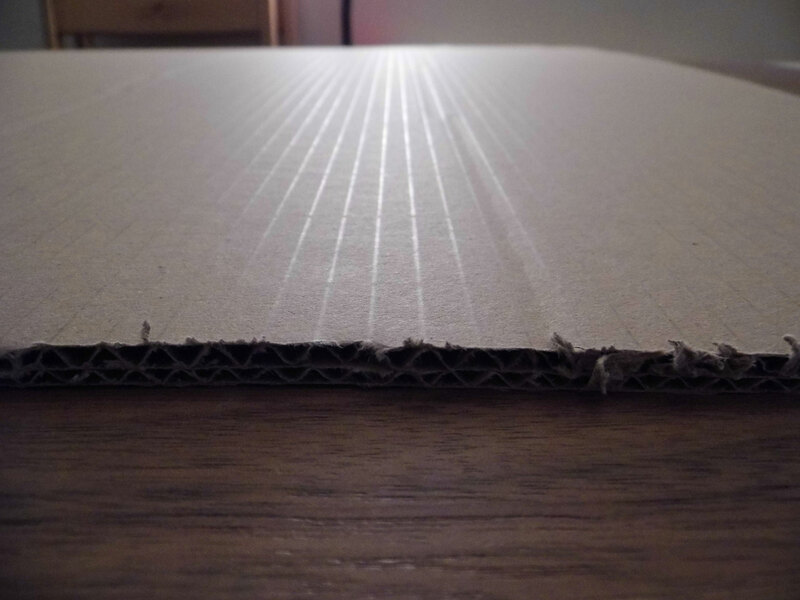 For a pleating board, you need something thin enough that the pleats will be sharp. 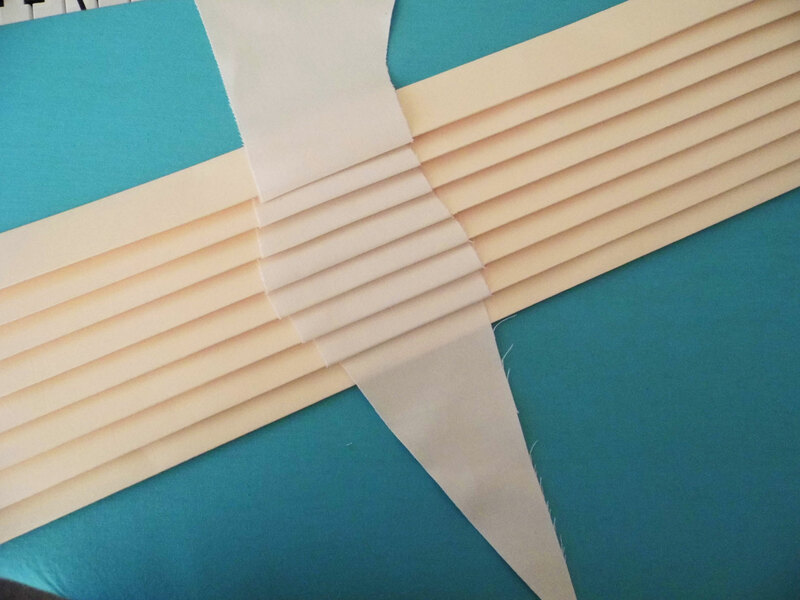 I used this tutorial on YouTube, but I didn’t back it with fabric – which I would definitely recommend if you’re going to try pleating a lot of fabric as my board kept expanding when I put the fabric in. But I just about managed it. 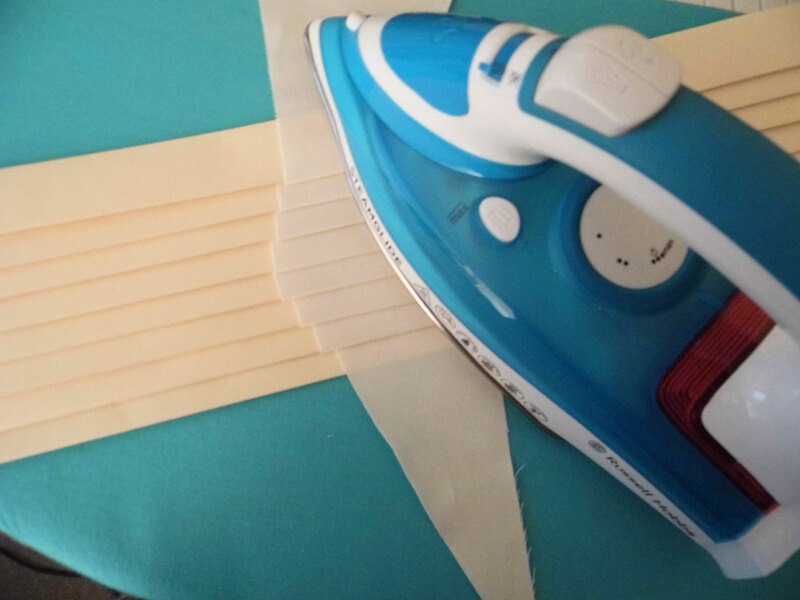 Once I’d made the board, I tested it and it seemed to work – and the fabric seemed to hold the pleats once ironed. 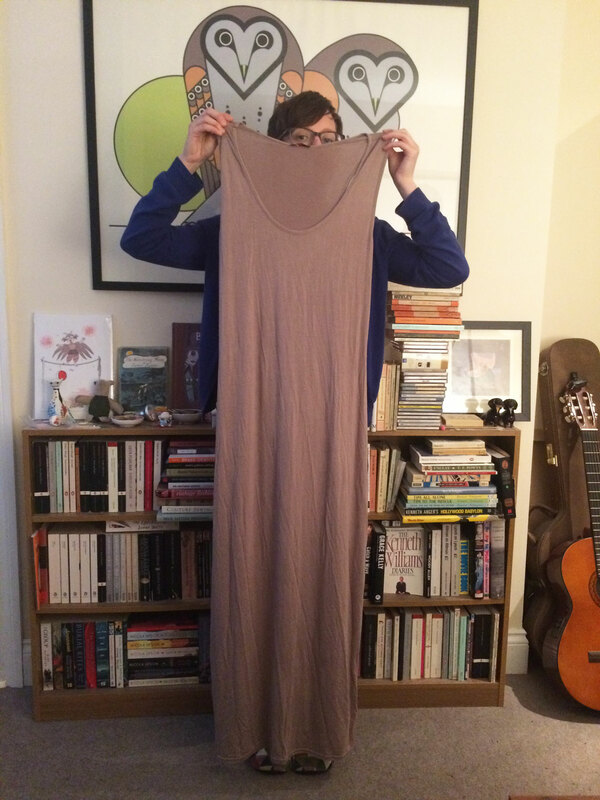 The fabric, which was actually much thicker than would have been ideal, was a viscose-something mix (I can’t actually remember) which I bought in my local fabric shop. 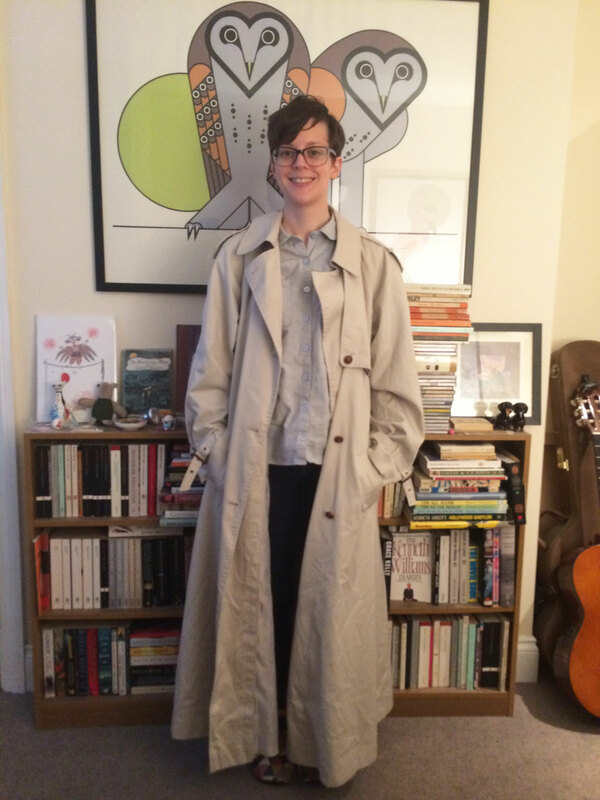 It was super wide and the ladies assured me that it would hold pleats, which was the main characteristic I was interested in. 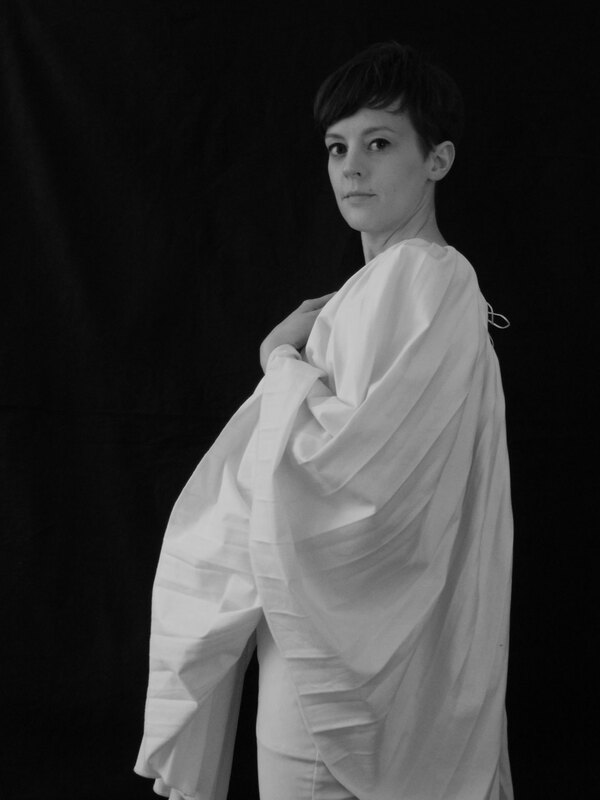 I bought 4 metres of the fabric and used about 1m for the trousers, which I didn’t really photograph, either while making them or while taking the final photos. 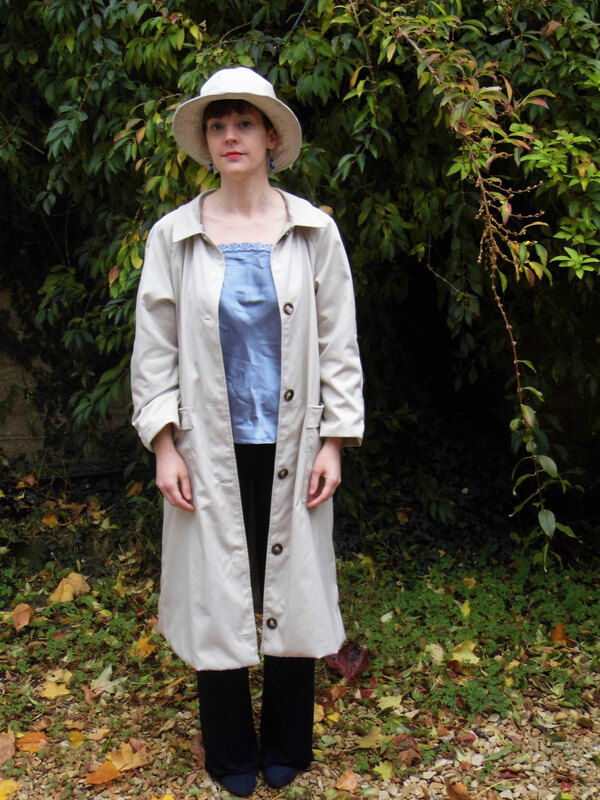 I used the Gertie Cigarette Pants pattern from her book Gertie Sews Vintage Casual as a basis, adding triangles to each side of the leg to make the flares. 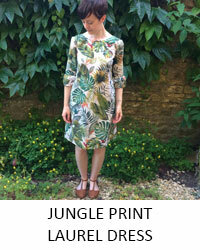 This was the same pattern I used for my Dressmaker’s Ball dress and I made some tweaks here and there, but it was a good job the fabric has quite a bit of stretch as it made them a bit more forgiving fit-wise and more comfortable to wear! 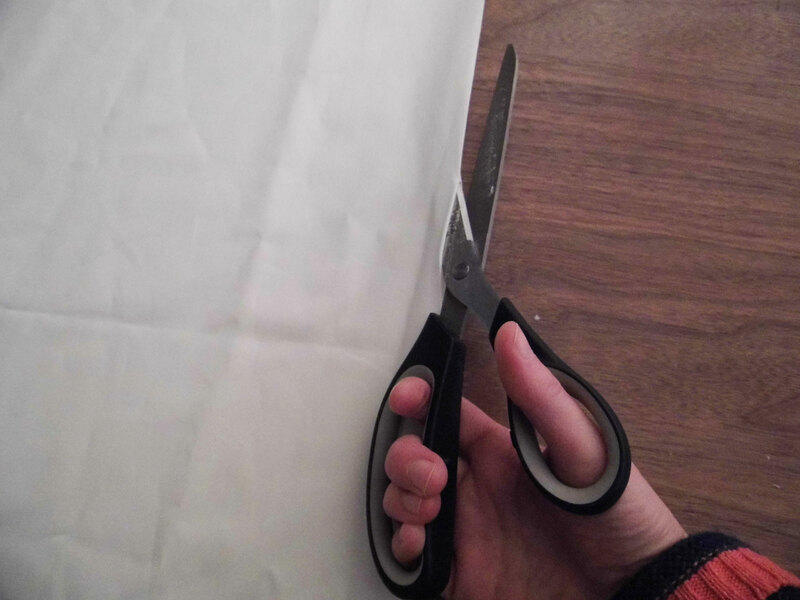 With the rest of the fabric, which was luckily really wide, I cut it in half parallel to the selvage to make about 5.5m of fabric which needed to be pleated! 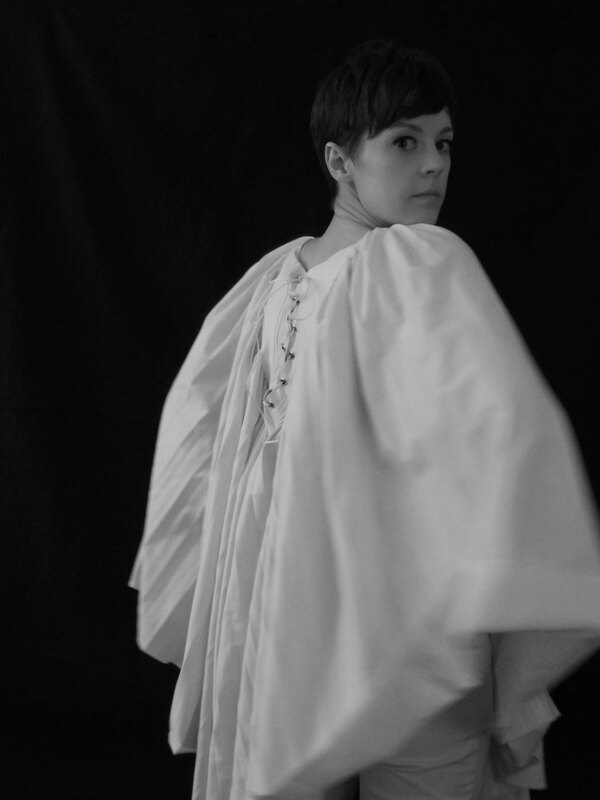 I got into a rhythm after a while and managed to pleat it all over the course of 2 evenings – of course I left making this outfit until really late so I was in a hurry and working on it every spare hour I could find. 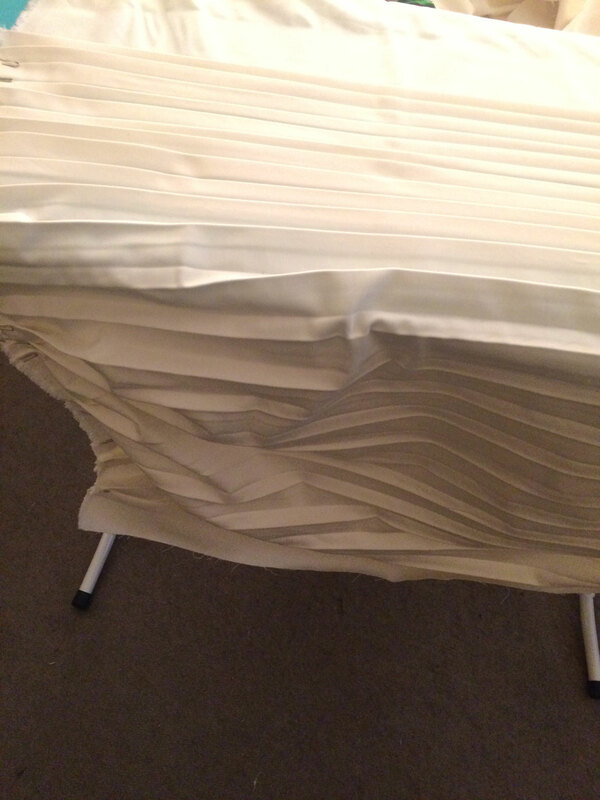 I used some paperclips to try to hold some of the pleats in place as I moved on further down the fabric as I was worried the weight of the fabric would mean the pleats would drop out. 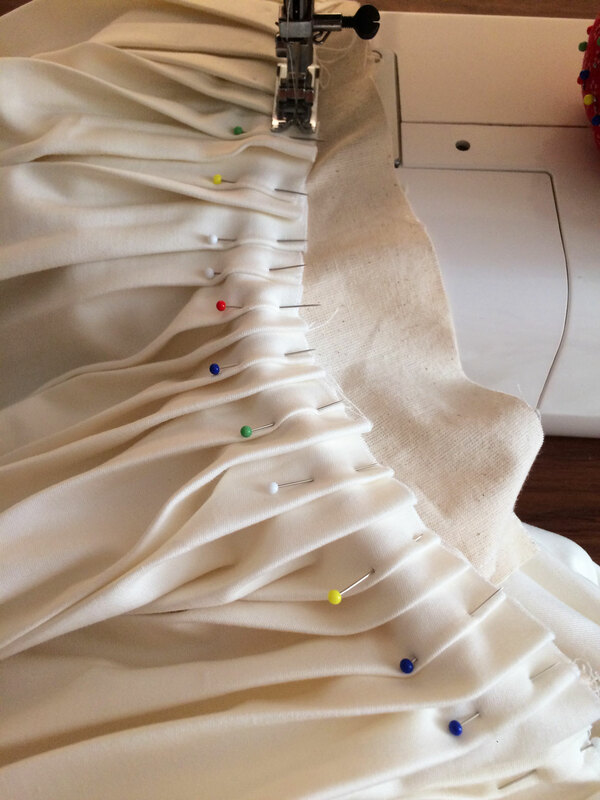 With the majority of the fabric pleated, I used every other little scrap of fabric to make the yoke pieces. 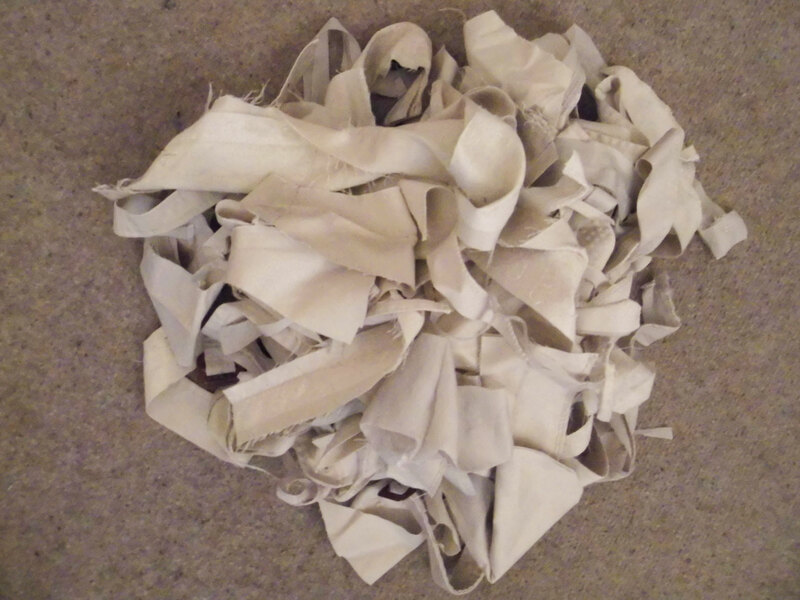 But first i cut them out of calico, to be the under-layer which would hold most of the weight of the pleated fabric – and it was heavy! If I made this again I would definitely use something lighter! 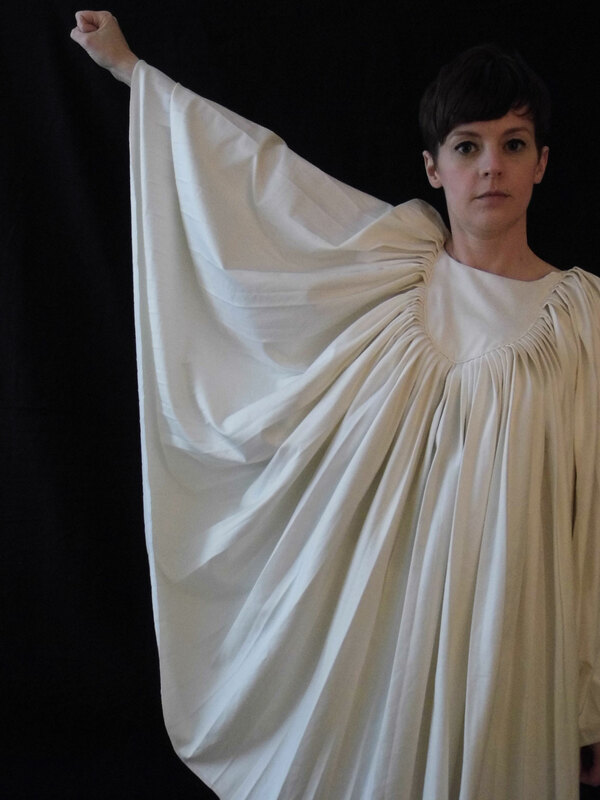 Here are the front york and 2 back york pieces sewn together at the shoulders – a lot of this was guess-work, and holding pieces of paper up to myself to figure out how big to make them, but I did use the facing from the Inari tee and dress as a basis for the length and shape of the neckline. 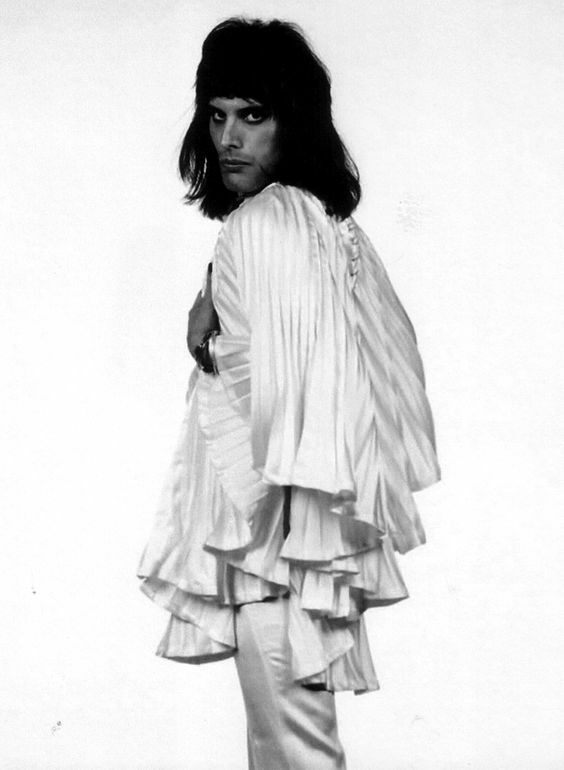 I’m pretty sure the original Zandra Rhodes outfit only had one seam in the pleated fabric, probably at the back, but I had to have 2 so I had one at the front and one at the back, so I stitched the front seam together before I started pinning it to the calico support structure. 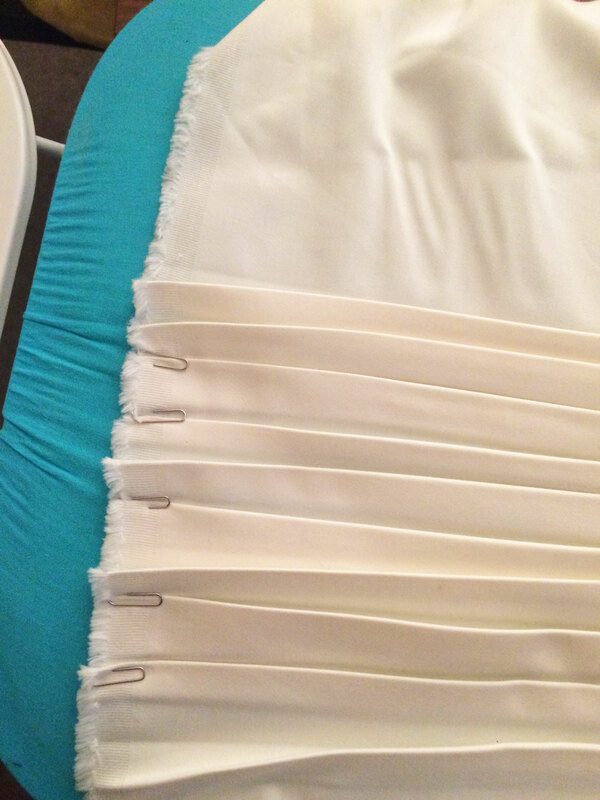 I then pinned all of the pleated fabric onto the calico under yoke. 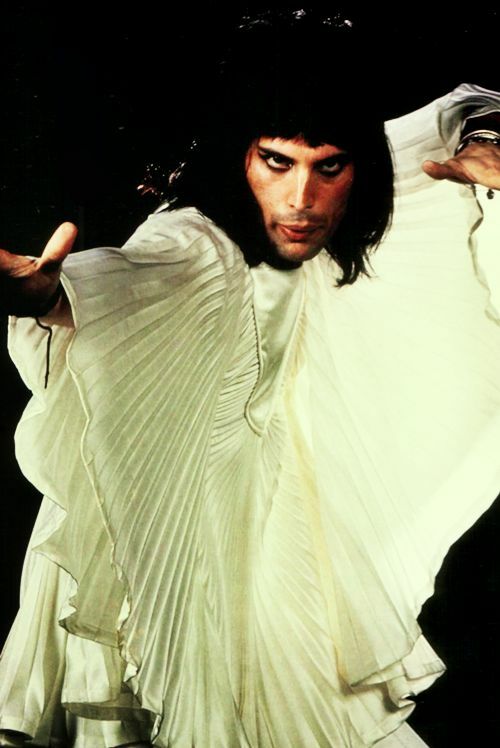 In the original outfit, I think it looks like there was more fabric in the middle of the front and then it’s a tiny bit more spread out as you move up Freddie’s body and over the shoulders, but I didn’t have anywhere near enough fabric to make it look exactly like the original – I would love to know how much fabric is in the original, I think it could easily be twice as much as I had. 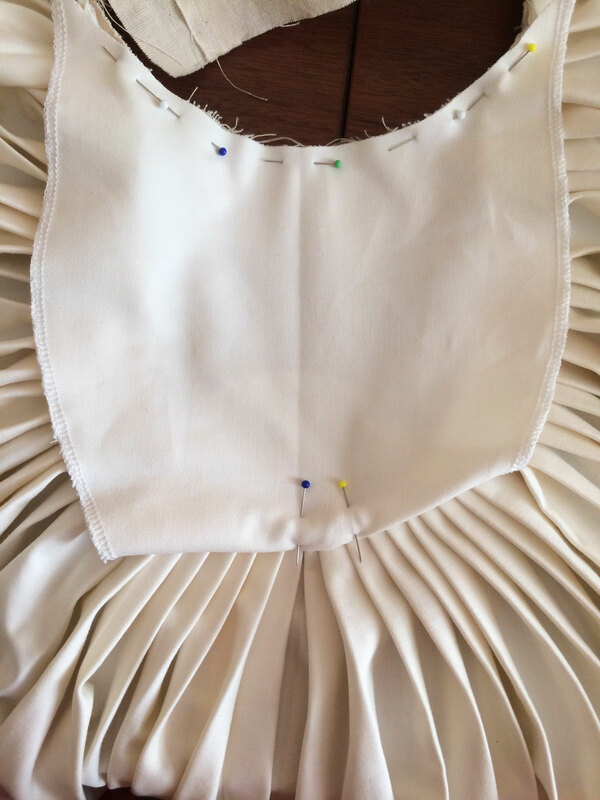 After sewing on the pleat to the calico, I then cut the front parts for the yoke to cover all the stitching and everything, from the main fabric. 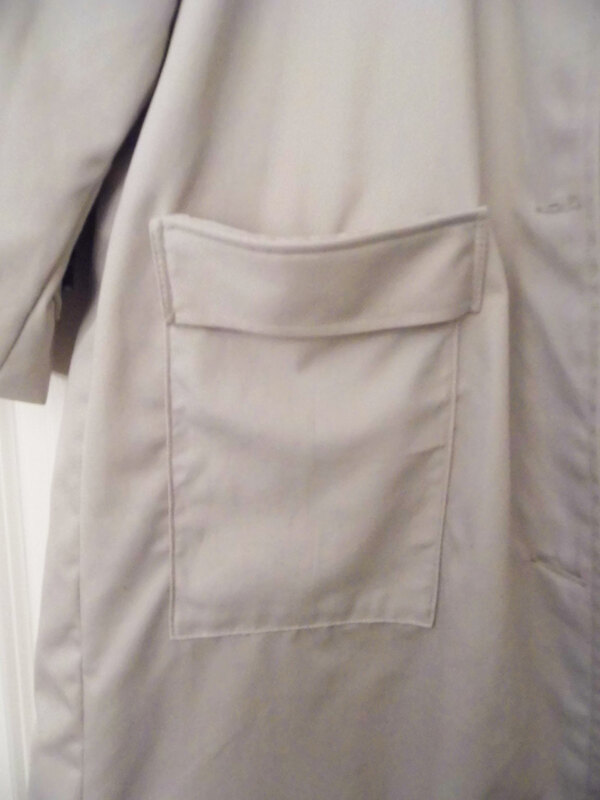 I added a seam allowance so I would be able to fold the edges in, like a patch pocket. 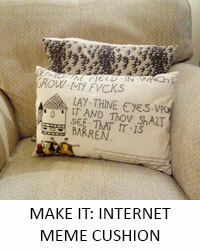 I also overlocked the edges as the fabric frayed like crazy! After lots and lots of thinking about how to construct the top – mostly when lying in bed trying to sleep – this was the only way I could come up with to make it. 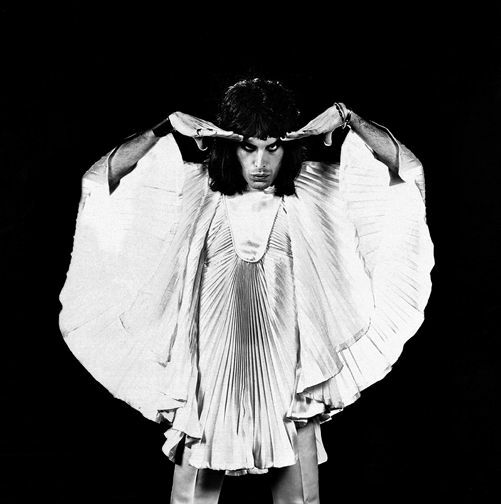 I figured it didn’t matter what it looked like on the inside as the outfit was for one party, but I would love to have a look at the original and see how it was constructed. 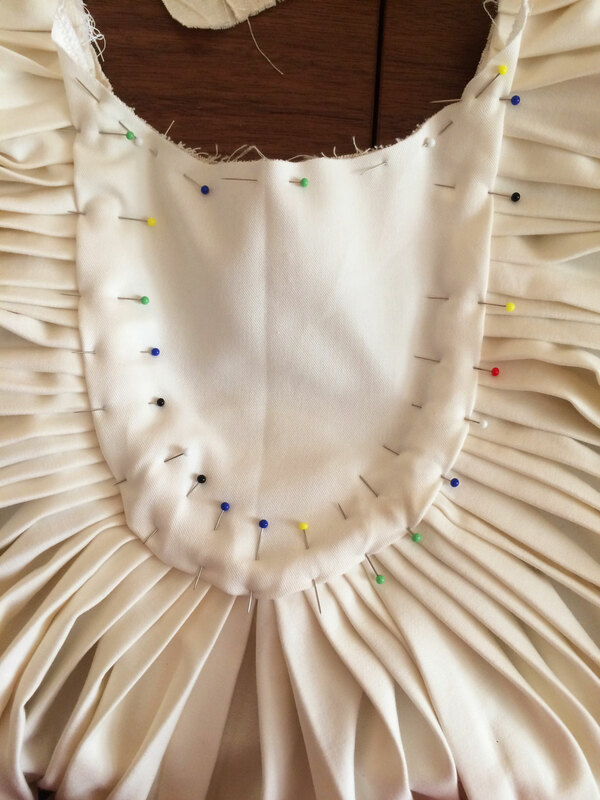 When pinning the front part on, I pinned the necklines together (which were the same size as I didn’t add seam allowance there), then worked from the middle out towards the shoulders, to try to make sure it was straight compared to the layer underneath. At this point, I was pretty excited with how it was looking – and to be honest pretty pleased with how it was looking. It seems that it was at this point that I stopped taking photos – I was stitching the top yokes on in the afternoon of the day of the party so I assume I was so rushing to finish that I didn’t document the rest of the process, but the back was pretty much the same as the front, which looked like this when it was all finished. 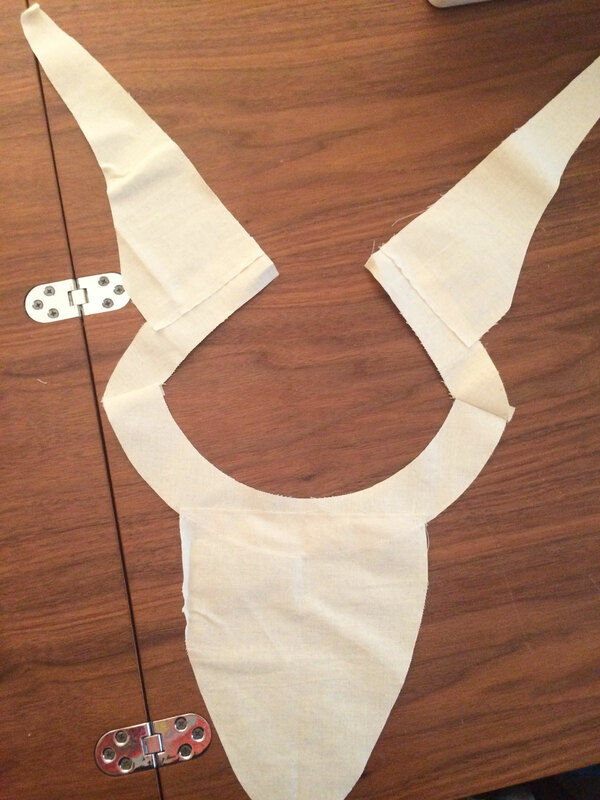 I then added a facing around the whole neckline, again using the Inari pattern as the basis. 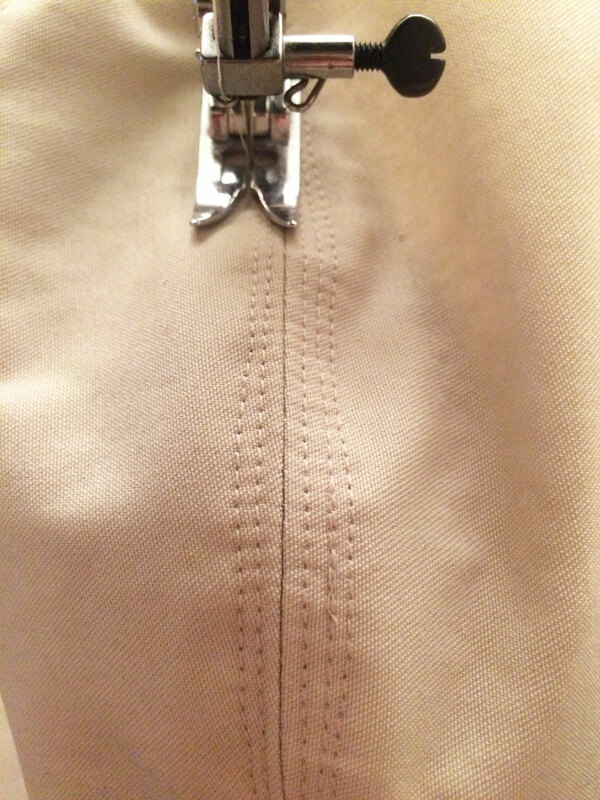 Then I added some eyelets to the back, to be able to lace it up (which facilitates being able to get in and out of it. 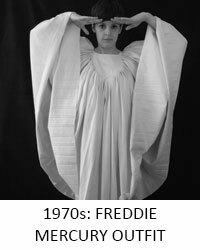 And now after all that writing and the in progress photos, I couldn’t resist trying to recreate the Freddie photos at the top of the post. 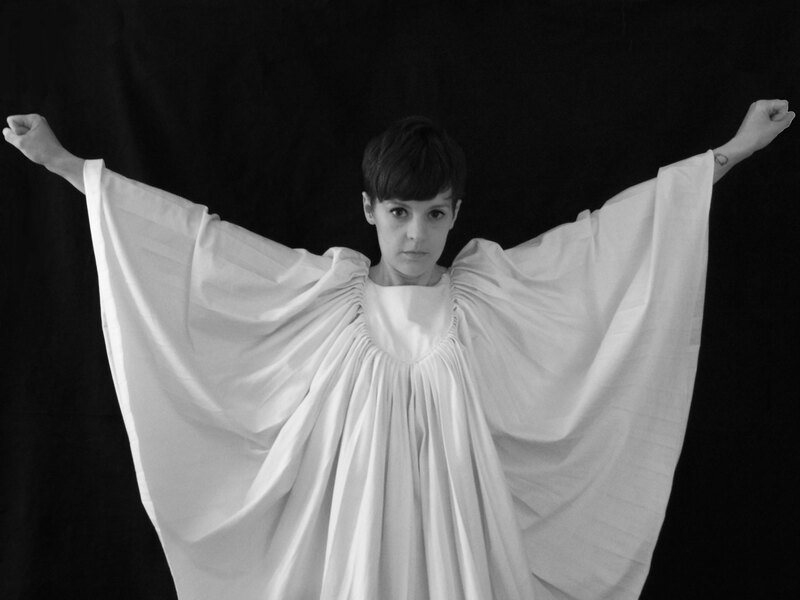 You can see in this photo, below, how there wasn’t anywhere near as much fabric in my version as in the original, but you get the idea and it was good enough for a one-off party. 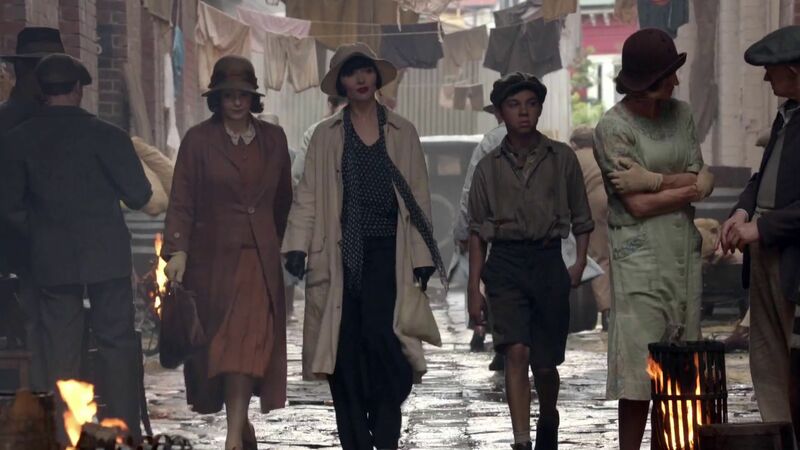 Hopefully with my next Hundred Years Wardrobe make I won’t be in so much of a hurry (though who am I kidding, I love working last-minute to a crazy deadline!) 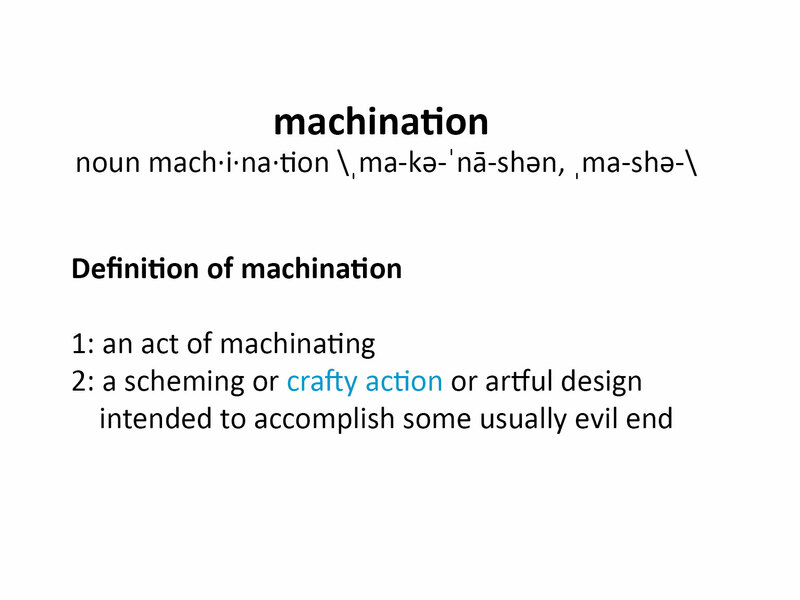 so I’ll maybe have more than one post to write, about some new techniques I’ve discovered or some more inspiration images. But at least I’ve got the ball rolling!